The day started off mostly overcast with intermittent breaks for the sun to burst through. 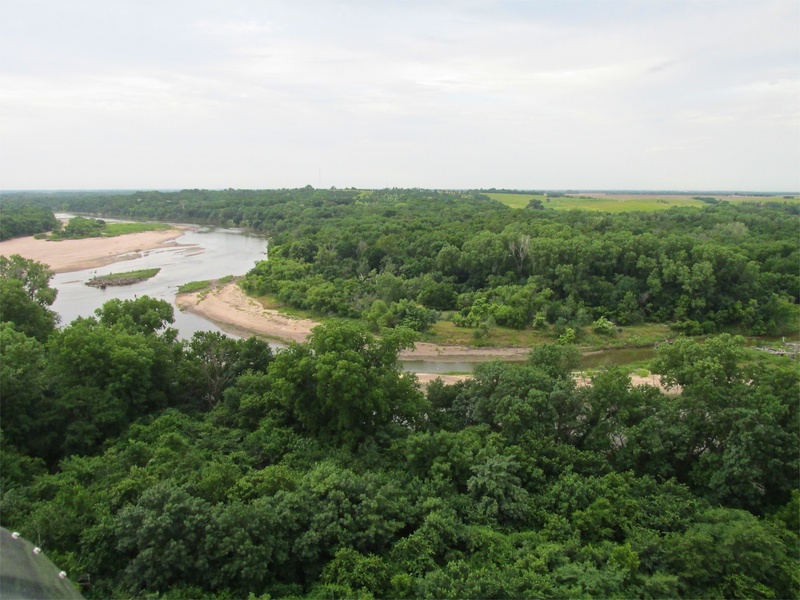 We had been having a lot of rain in Kansas the preceding weeks and in keeping with that the forecast for that Saturday indicated the possibility of more rain. Frankly, I have never understood what a “30% chance” of rain means. But, that was the best they could offer. My general operating principle when presented with an inconclusive weather report is to go to the airfield and look at the sky. If conditions “Look OK”, it is not prohibitively windy and there is no indication of lightning, I take to the air. That Saturday morning my simplistic criteria were met so I lifted from earth heading South Southeast for Strother Field. 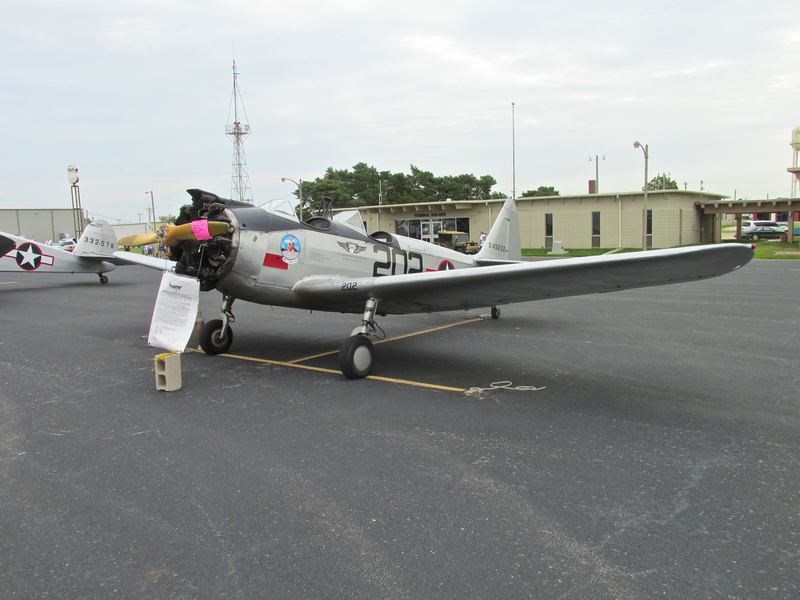 The sun burst through the overcast for a moment as I prepared to do my walkaround, preflight inspection. I knew the moment wouldn’t last so I snapped this shot. To give you a more complete idea of the atmospheric condition, I took this picture looking South Southwest while the motor idled to warm up. Two weeks earlier I had taken a flight to Caldwell, Kansas “smack dab” in the middle of Sumner County, The Wheat Capital of the World (You can see that story HERE). 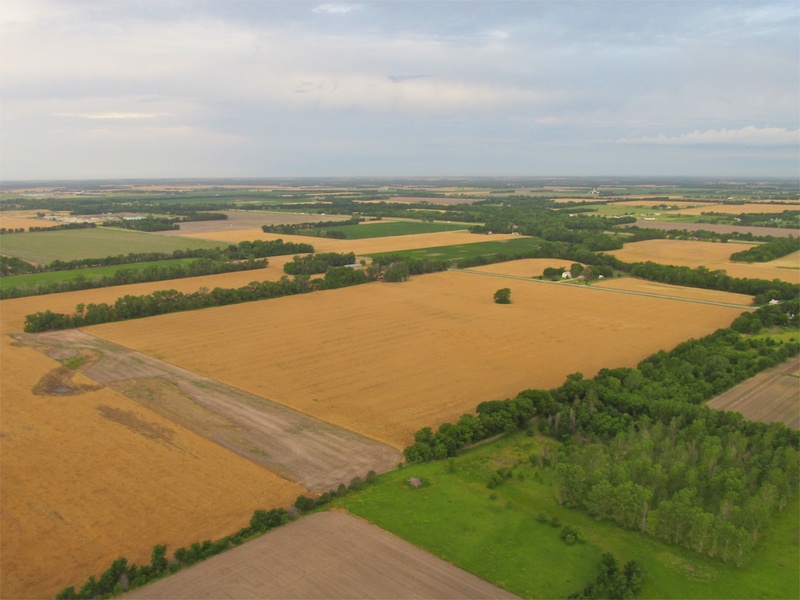 I was awestruck at the beauty of the endless green wheat that blanketed the prairie. 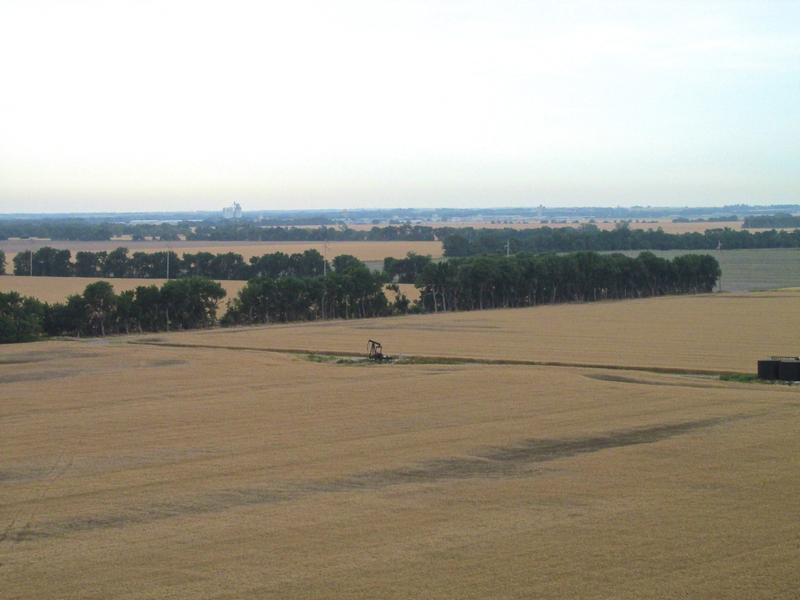 Now, only a couple of weeks later wheat in the region had already turned yellow and was getting close to harvest time. I took a few pictures to show the change. 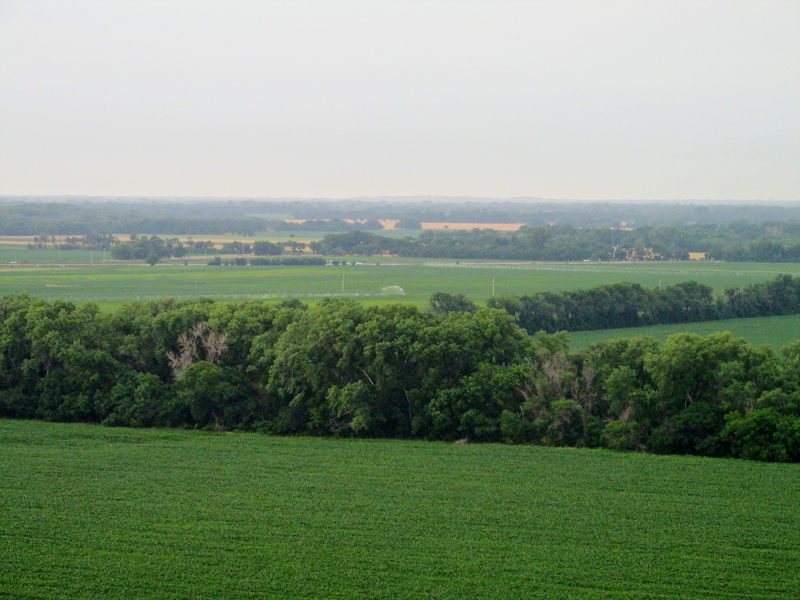 The Kansas countryside just South of Haysville and Derby features a delightful mixture of green and yellow. 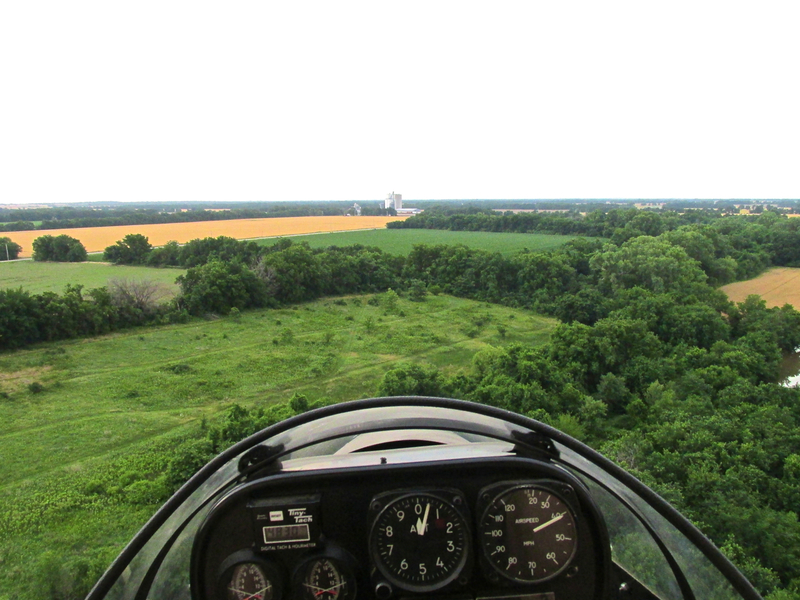 Even though there was a headwind at 500′ AGL of only 8 miles per hour, I dropped down to Ultralight Flight Level 75 where the wind was nil. There I could make relatively good speed (38 mph airspeed) while keeping the engine turning at a leisurely 4300-4500 RPM. It saves gas, and besides, the plane doesn’t like to fly much faster than 60 anyway. The closer you approach that max speed the more energy it takes to push it through the air. I looked ahead and saw an interesting phenomenon for this part of the country – A HILL. It’s no secret that this is The Flatlands but a rare rise in the ground is more obvious than in other parts of the country. You can see what I am talking about at the horizon. When I got closer the “mountainous mound” was more apparent “panoramically” but my camera lens captured it better from a distance with this shot. “High Ground” in the distance. Now that the wheat is about to be harvested the corn crop has begun to grow. 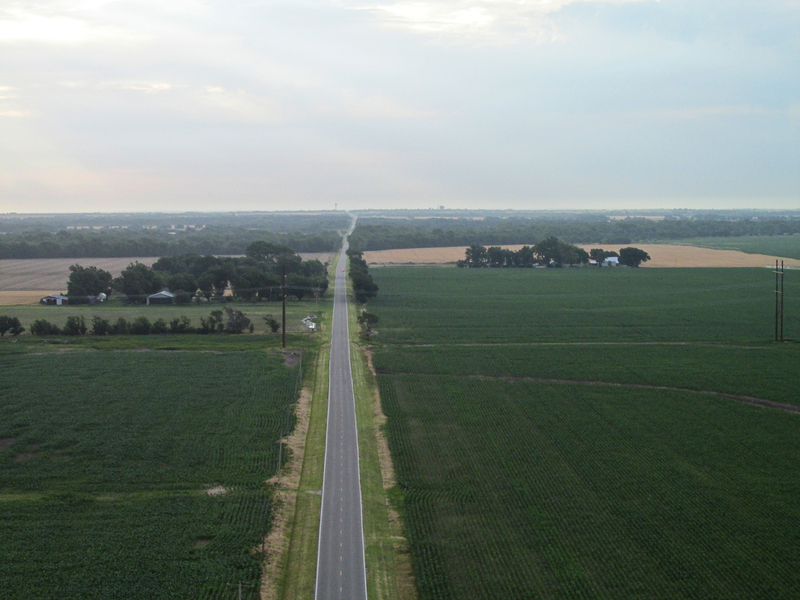 I believe this is a highway leading to Oxford, Kansas. 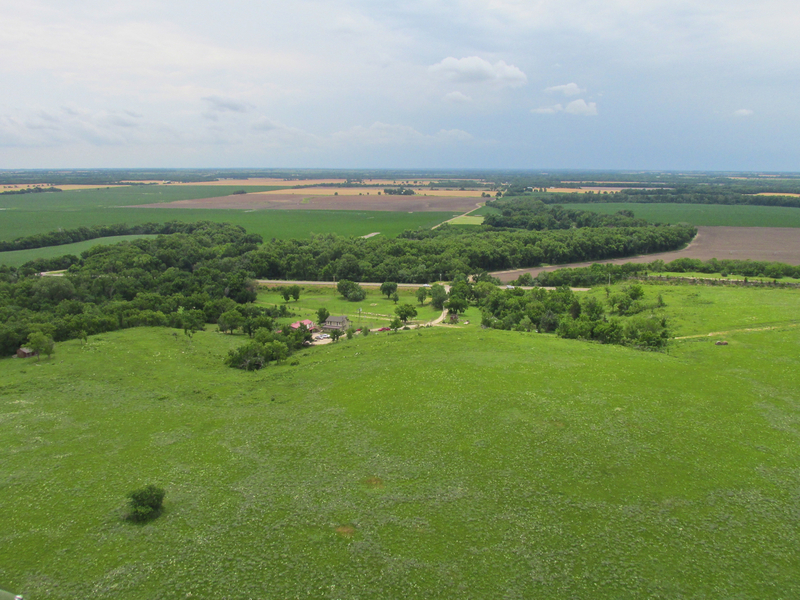 Earlier I showed a “High Point” South of Haysville. Here as I pass again over the winding Arkansas River you can see this “rise” but closer now. Because I now see there are two antennae on it, I am further impressed with my topographical accumen. Whenever possible, radio and TV tower engineers build where the ground is higher. Crossing the Arkansas River. This is looking Southwest from 150′ AGL. “High Rise” by the river with the antennae at the top. Years ago, DuPont used the tagline in their advertising “Better Living Through Chemistry“. With the rise in The West of the anti-science “Greens”, DuPont decided to go with the flow and not incite the wrath of these modern day Luddites and so changed their memorable signature line. I thought of it, though, as I approached the scene below. Like it or not, chemicals play a large part in the success of American Agriculture and its ability to feed the world. Even though sprays are good for growing, I thought it best to stay on the upwind side of this applicator. Directly in my path I notice a settlement of some sort. At the moment I am pondering The Miracle of Kansas’ Agricultural Bounty, I found where all the Breakfast Cereal comes from. I expected to see Tony The Tiger at any moment. Passing near a wooded grove, bright colors attract my eye. Many times in Sky Surfing Stories I show pictures of meticulously kept troves of old cars in orderly patterns generally only visible from the air. 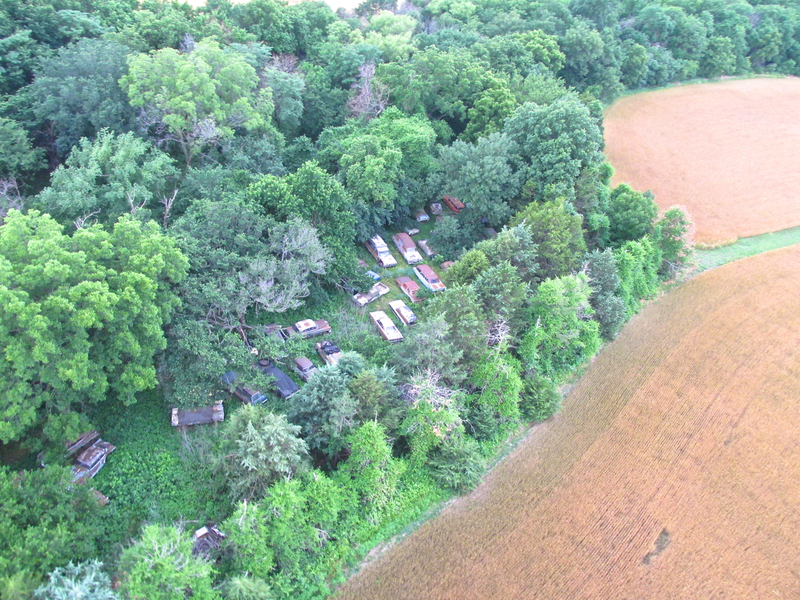 Below we see just part of a large repository of old junkers. This owner does not prefer the linear matrix approach to storage. Cars are spread randomly under the trees all over the site. There were at least twice as many cars under this green canopy than are evident in this photo. 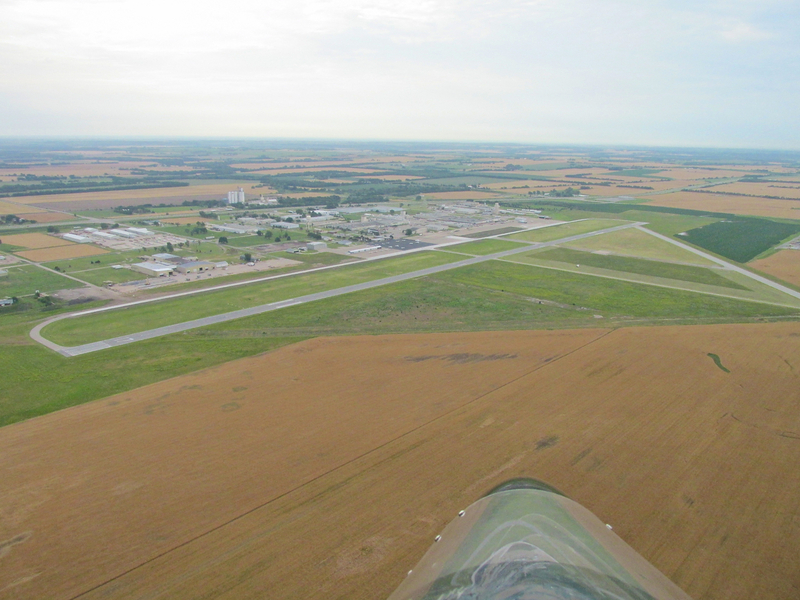 Even at low altitude, having flown to Strother Field a number of times, I knew I was approaching it when I saw the familiar outlines of its buildings ahead. Strother Air Field and Industrial Complex ahead in the haze. I am at 100′ AGL and climbing. The wind is from the South so I will be landing to the North (a Sky Surfing Eagle Eye Award goes to Brother John Rogers of Wichita, Kansas for catching this mistake) South. 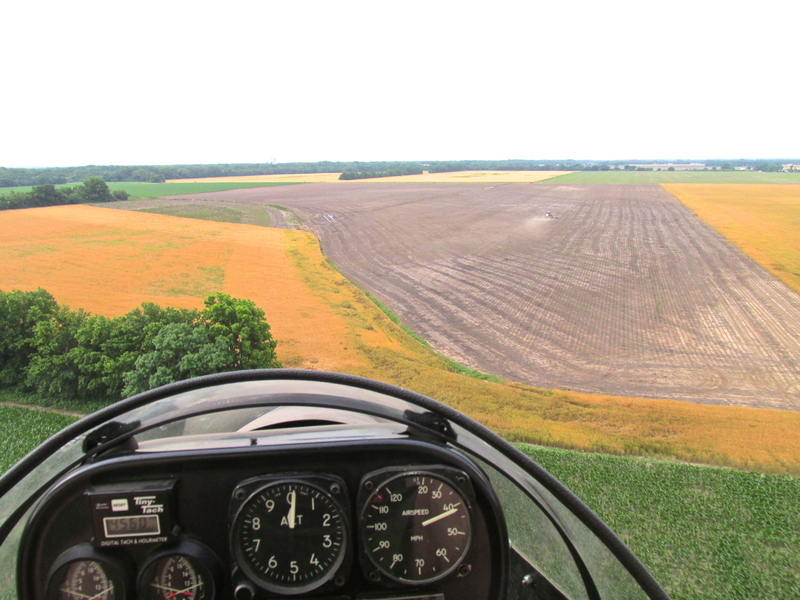 Strother is a “left pattern” airfield so I will climb to 1,000′ AGL, cross the field at center and then enter the Downwind Leg. Non fliers interested in learning about aircraft landing patterns can read an interesting description HERE. There was no traffic in sight so I took the photo series seen next. 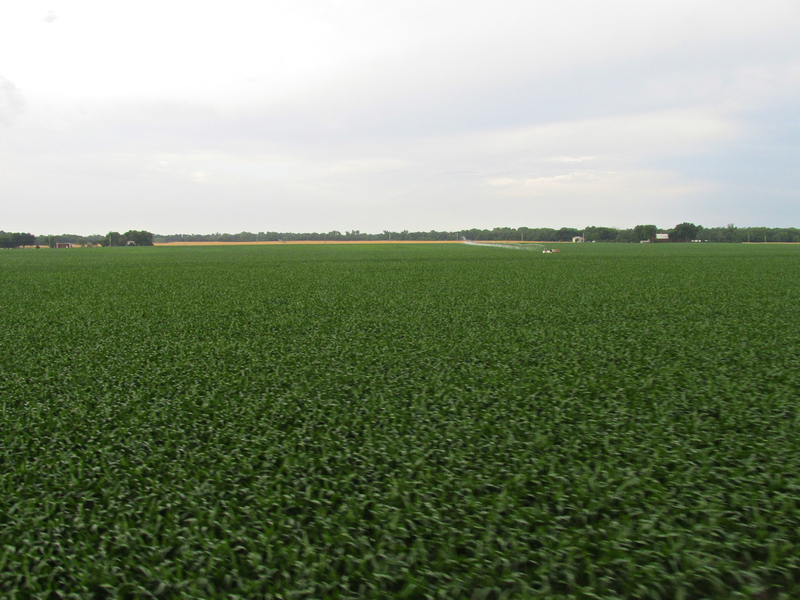 Strother Field from 1.5 miles Northwest at 700′ AGL. 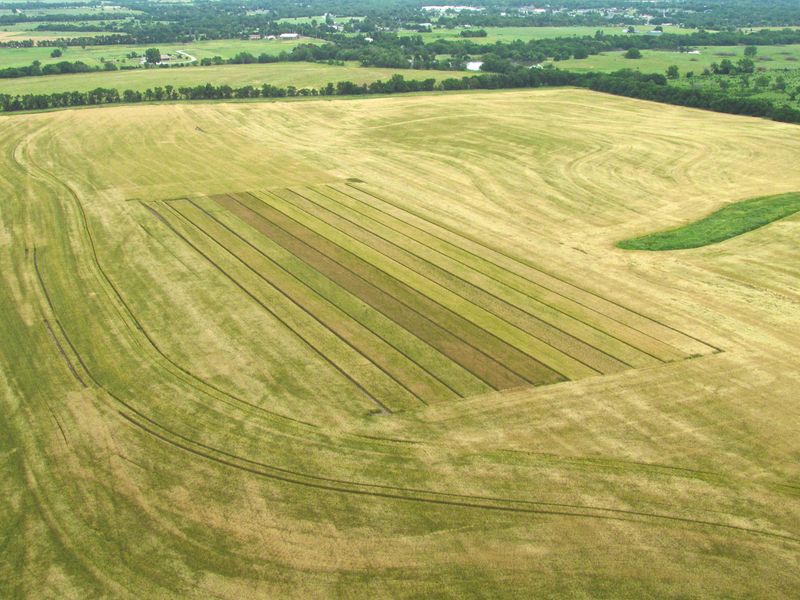 A half mile Northwest of the field at about 900′ AGL. 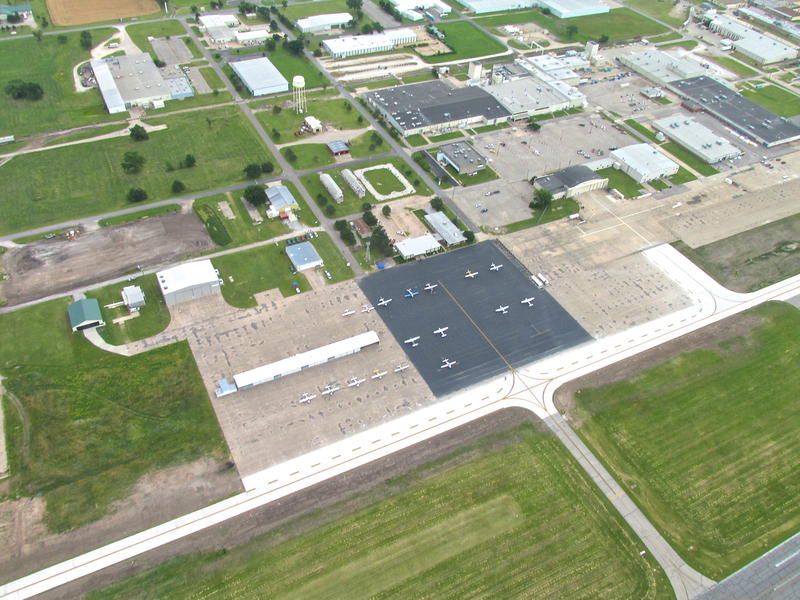 Strother Field Industrial Park. looking down as I cross the runway at mid field. A number of planes have already arrived. A “Follow Me” vehicle to show me a spot. The sky looks foreboding – rain possible at any moment. 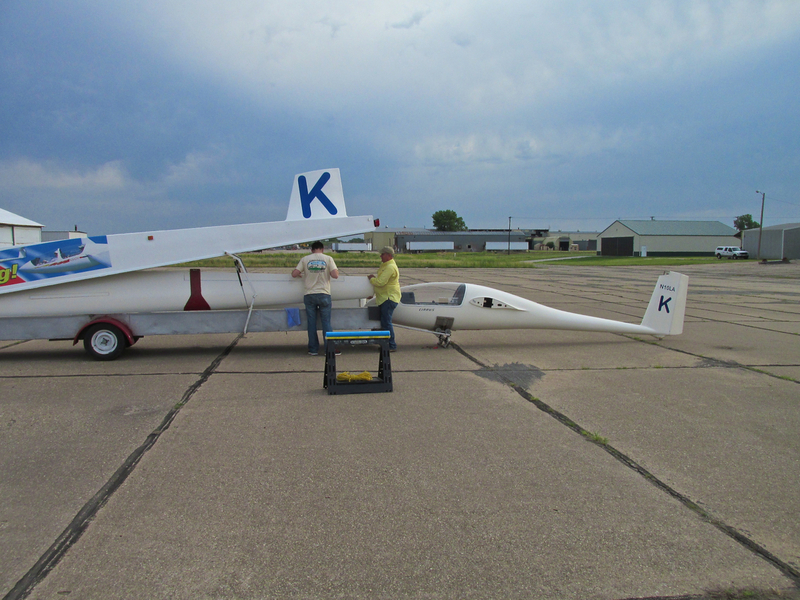 As I tied my Ultralight down, Tony Condon showed up with his sailplane to put on display. 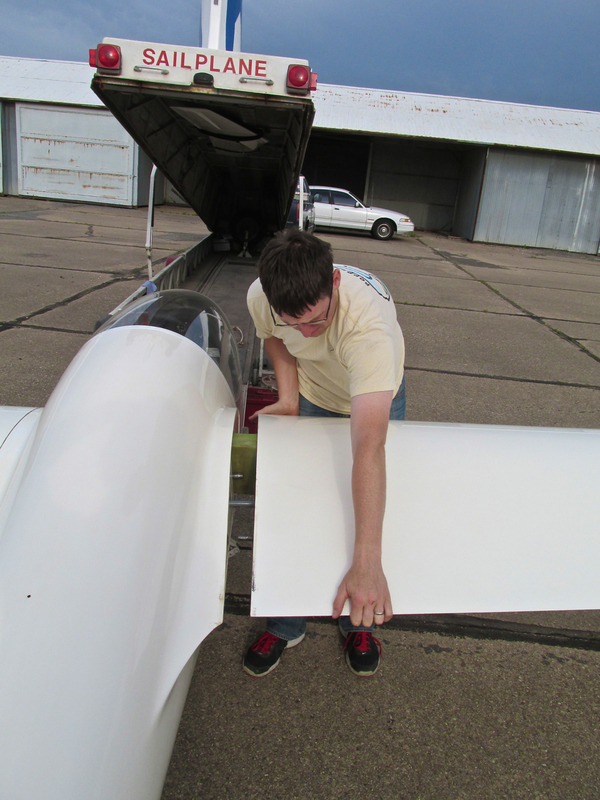 Jeff Beam already had his plane out so he helped Tony put it together. 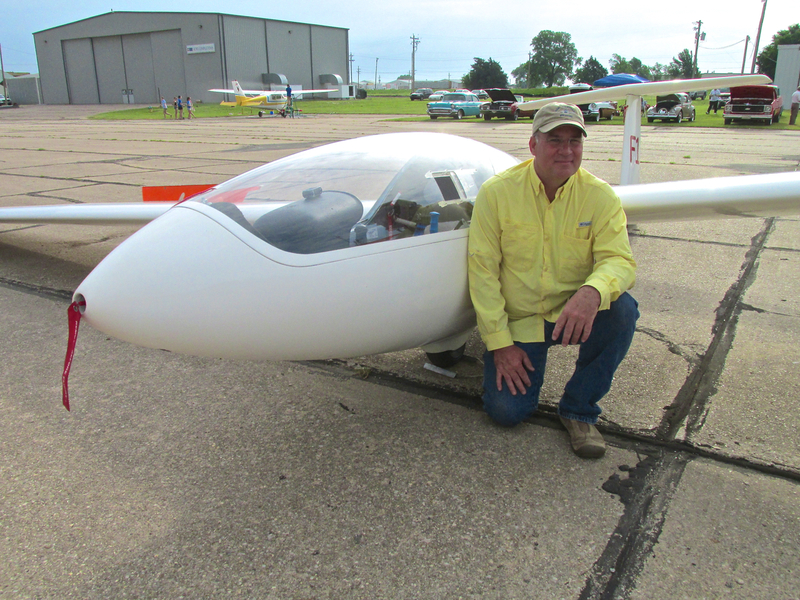 Jeff Beam and his F-1 Sailplane. I asked him to deploy the speed brakes so you could see where they pop out of the wing. “The Airbike Ace” aka Paul Fiebich. 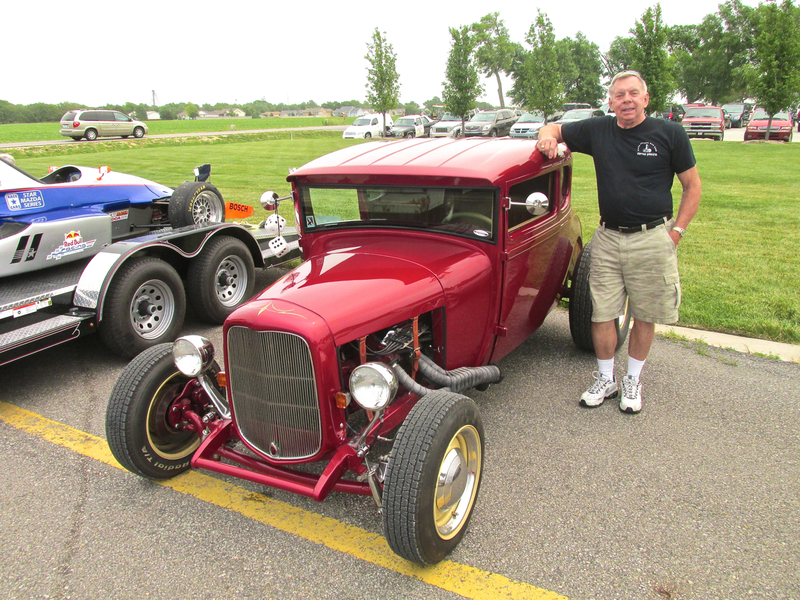 Every year The Strother Field Fly-In and Classic Car Show is dedicated to the memory of professional aviator Melvin Current who passed away in 2007. After arriving and tying down my plane I wandered about to see what was going on on the flight line. I saw this good looking dog taking his master for a walk and stopped to talk (to the man…). He turned out to be Brian Current the Son of Melvin. He told me a little about the family aviation business and how honored he and his family are to have their Dad recognized for his years of service to the Aviation Community. Melvin is missed by all who knew him. 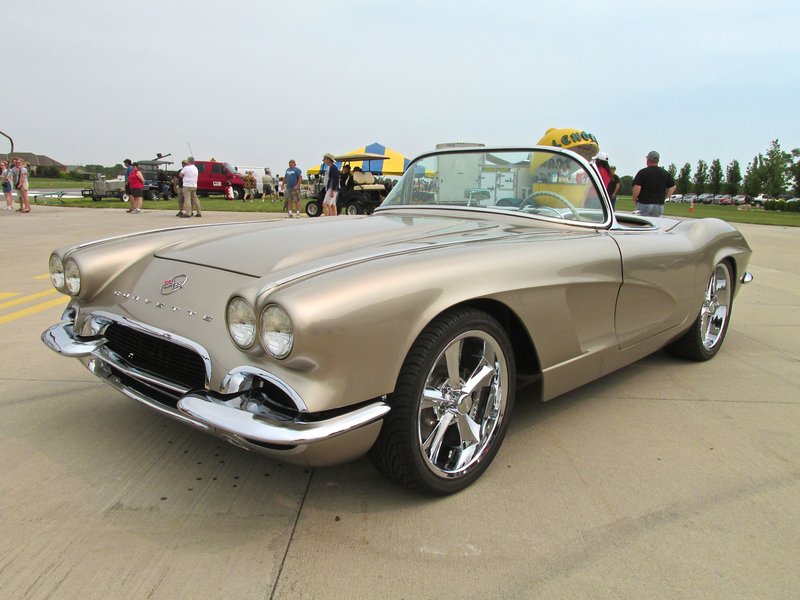 I really think the wedding of “Wings and Wheels” is a match made in American hobby heaven. I noticed “W & W” events popping up around the country a few years back and I think they will continue to thrive. 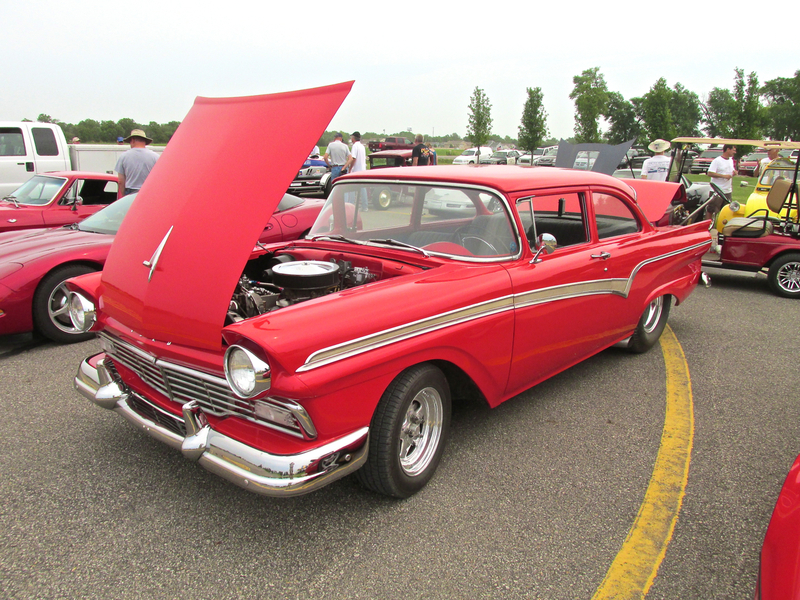 I enjoy looking at Classics, Hot Rods and Kustom Kars and all the pilots I know like them, too. 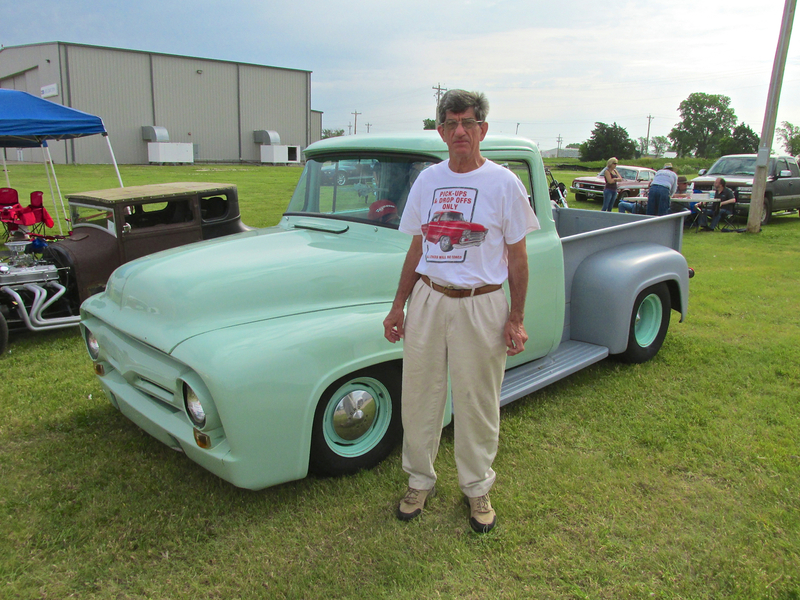 Jim Blatchford and his 1956 Ford F-100. I really like that color combo. 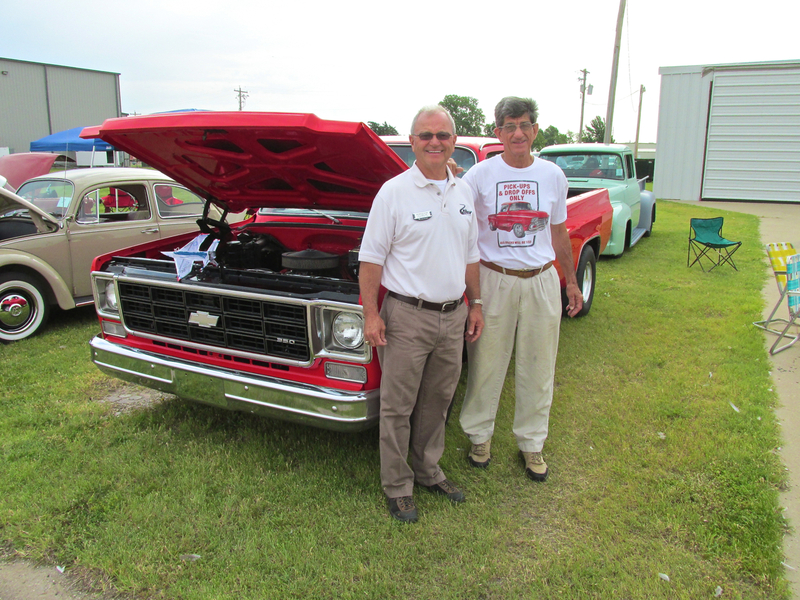 Jack and Jim Blatchford in front of Jack’s Chevy. Jack also brought his personal jet to show off (displayed under hood). My Parents had one of these when I was young. 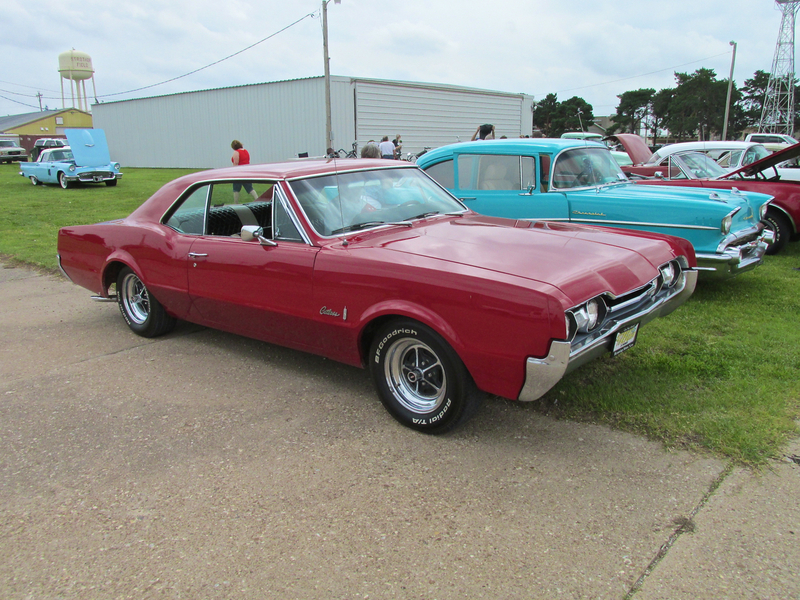 In my College Days, I owned three of these (well, my Parents owned the first one…). None of them looked anywhere near as sharp as this one, though. 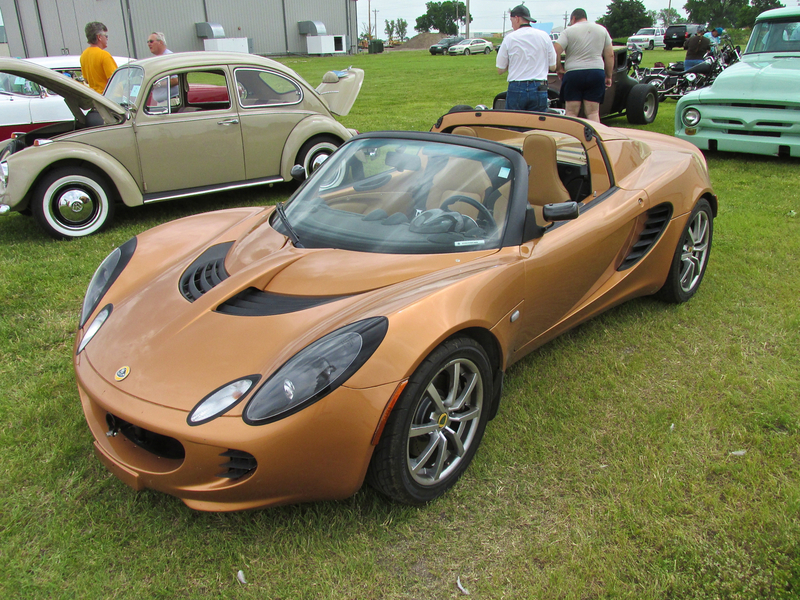 A 2007 Lotus Elise owned by Jerry Hopper of Winfield, Kansas. “Airbike Ace” Paul Fiebich, Lawrence Alley and Terry Alley. Like most of us, all it takes is a good flight, pancakes and coffee and we are happy in the morning. Terry and Lawrence Alley had flown in from Alley Field with their Champ. 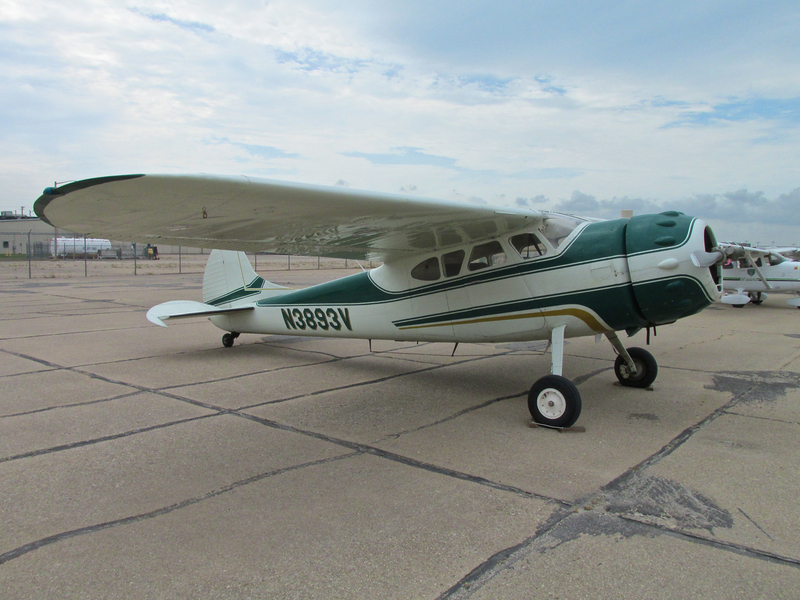 This attractive and well-kept 1949 Cessna 195 is owned by Bennett Sorenson of Wichita, Kansas. 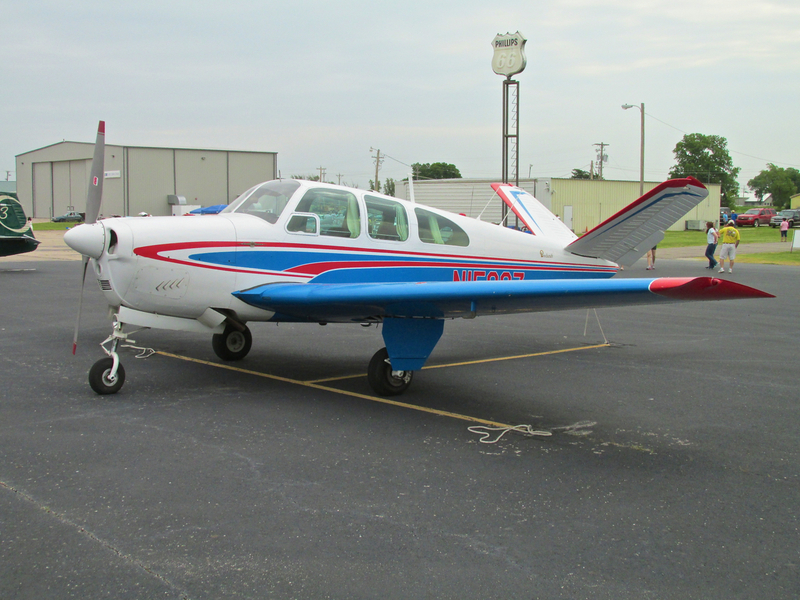 A beautiful P35 Beech Bonanza owned by Lester Mitchell of Oklahoma. The venerable V-Tailed Bonanza is in my Top Ten List of All Time Best Looking Airplanes. 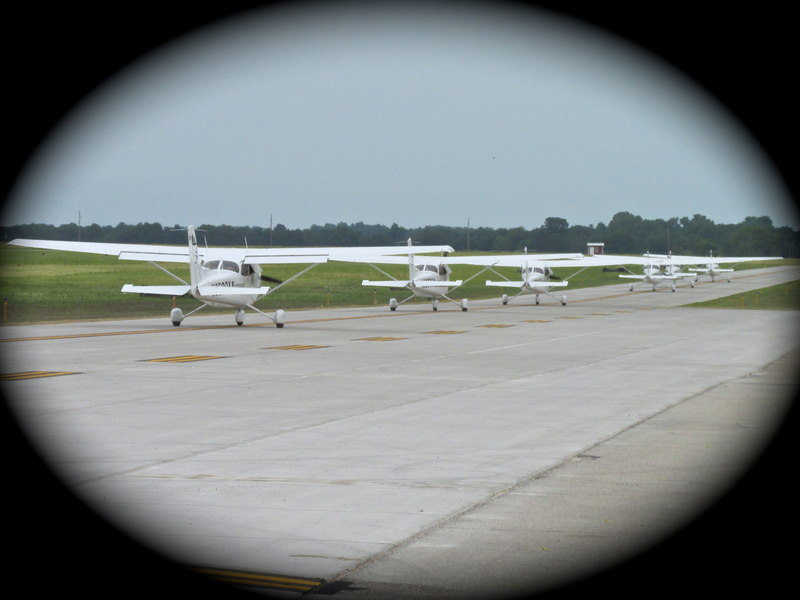 Six identical Cessna 172’s left the field that morning on the first leg of the Discover Flying Challenge 2013 (read more about it HERE). 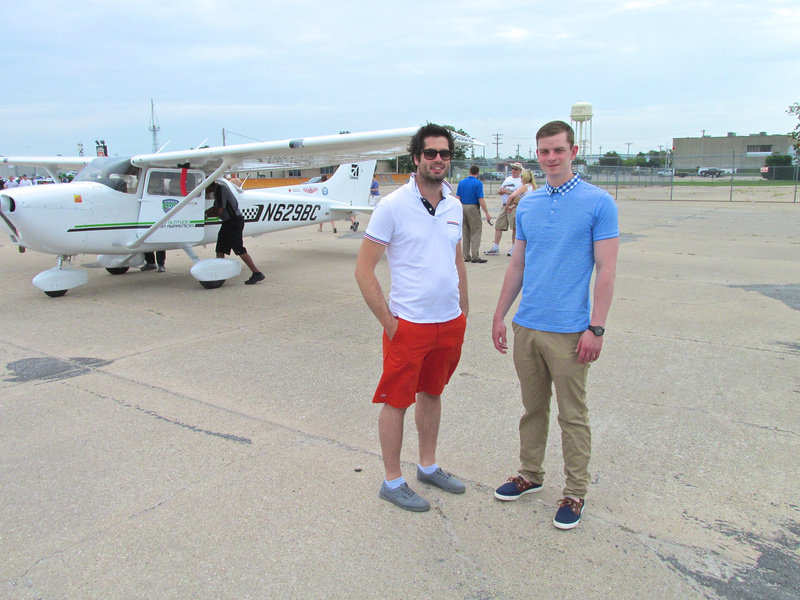 Piloted by six aviation students chosen from a large group of applicants, these six planes will be touring the country all summer giving rides and promoting aviation. What a blast! 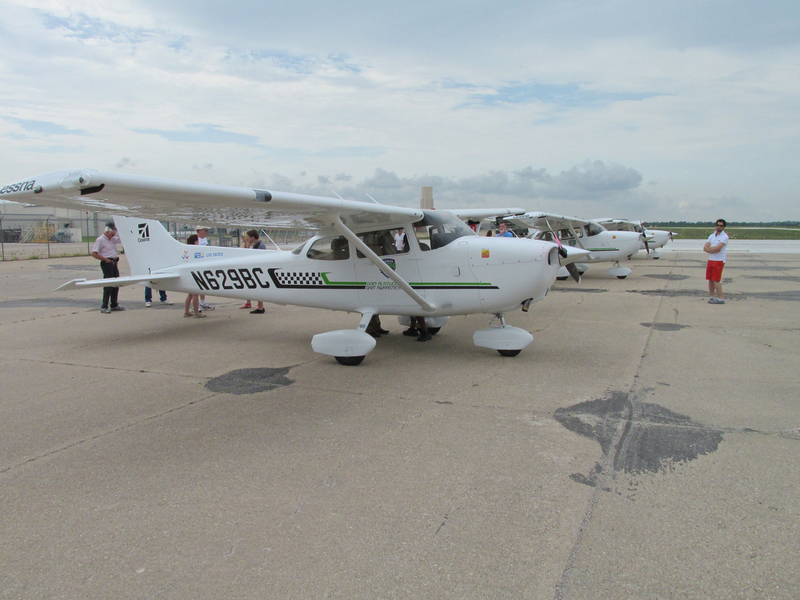 Three of the six C-172’s fueled and ready for an Excellent Summer Adventure! Already in “promotion mode”, a member of the Discover Flying Team takes someone up for a ride even before the tour began. Here we see the “Fun Flight” leaving en masse. Once airborne they will head out on all points of the compass in search of adventure and to promote flying to the public. I learned to fly in a Cessna. The Skyhawk is an excellent choice for this mission. Folks were interested in the tour and gathered around the planes talking with the pilots and the Cessna officials. I noticed the two guys shown below and struck up a conversation. From their accents my lightning fast mind told me they were not from Winfield. Actually they were not even from this hemisphere. Daniel Brink from Australia and Harry Momber of England. Both are engineers working in the Wichita Aerospace Industry. 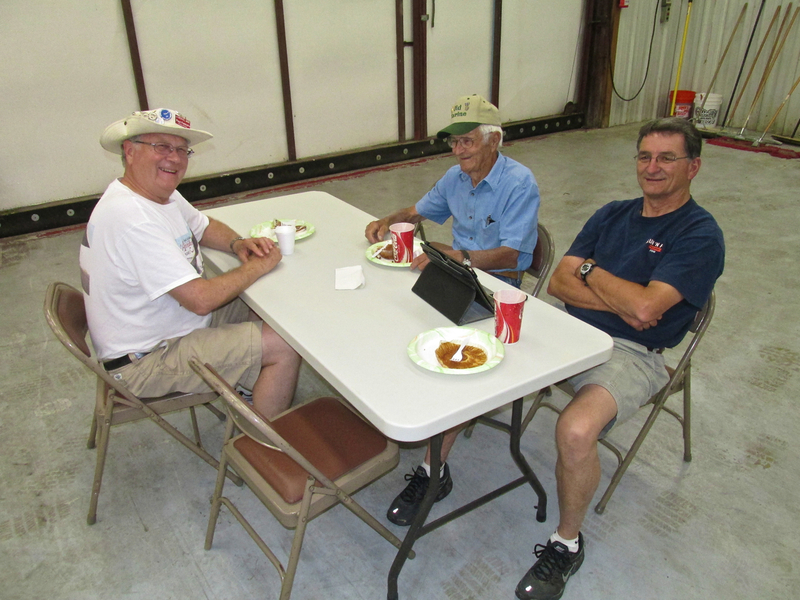 Being “Airplane Guys”, they drove out to Strother to see what was going on. 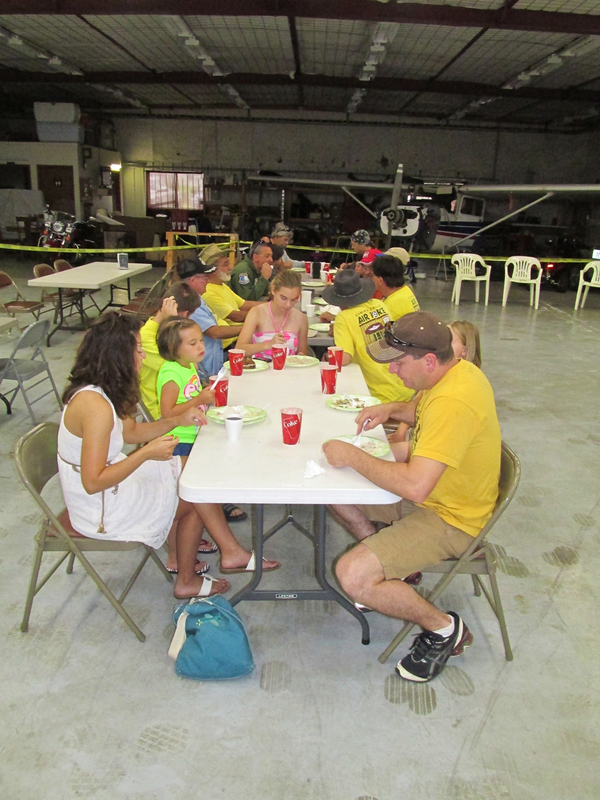 A welcome sight at many a Fly-In and Airshow around the region is the CAF. 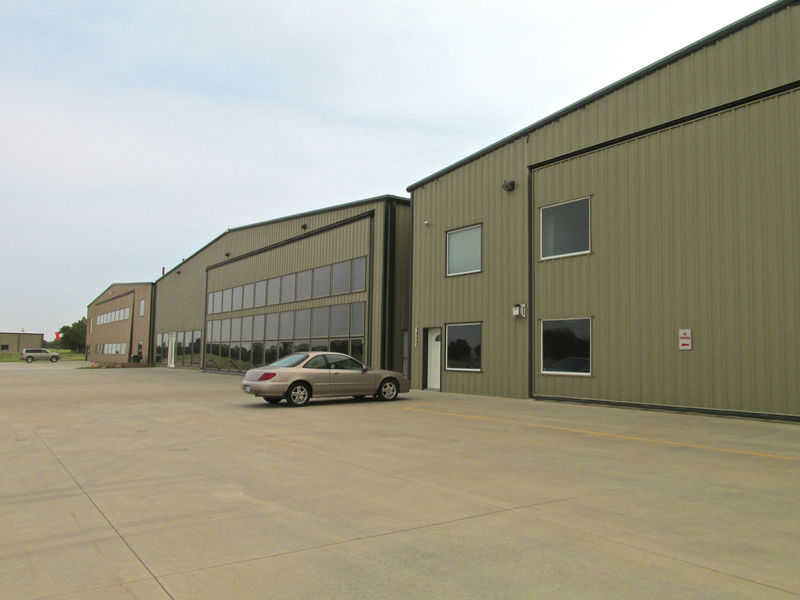 Called The Jayhawk Wing, this group is headquartered at Westport Airport in Wichita, Kansas. 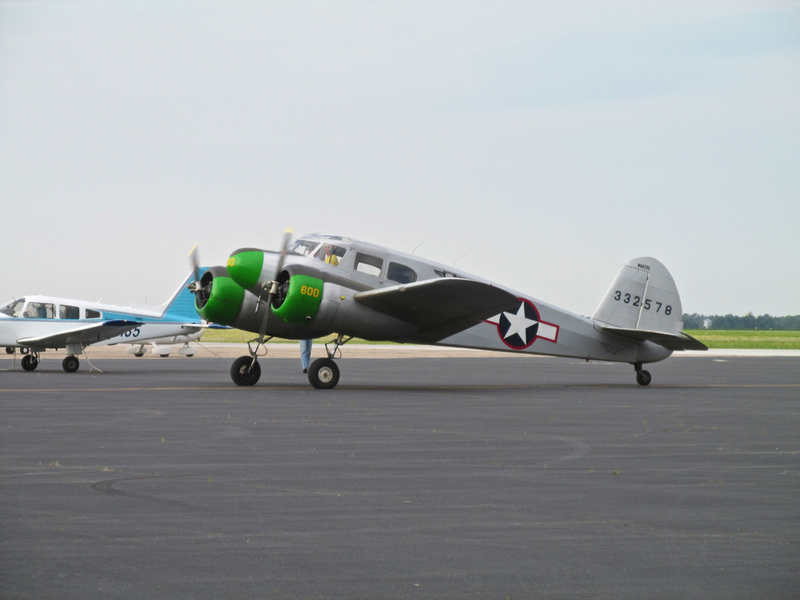 They have a Fairchild PT-23, a Cessna Bobcat, and and SNJ-4. They are a dedicated bunch and put a lot of time and effort into showing these interesting aircraft and providing rides. 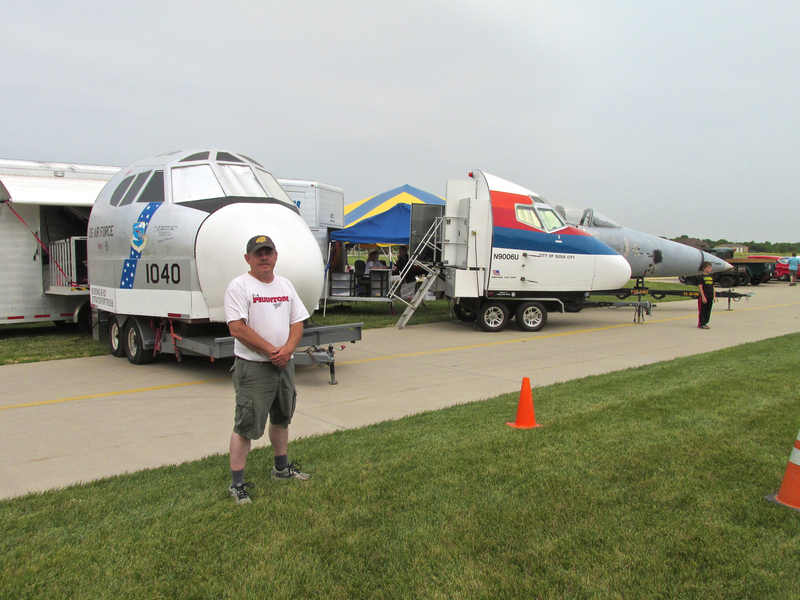 CAF Ground Support Team offering Commemorative Air Force and Aviation Momentos Galore. 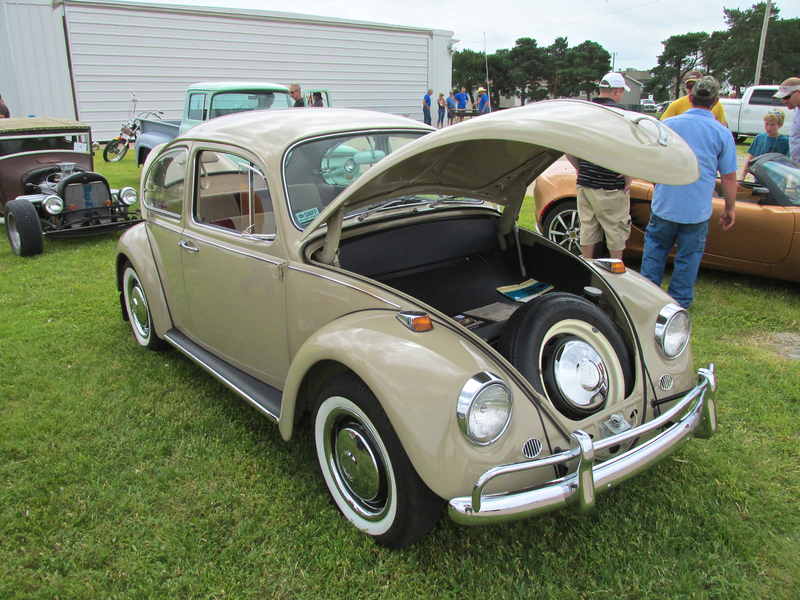 “Life is like a box of chocolates”, said Forrest, “You never know what you are going to get.” Wisdom from The Gumpster and true of The Sixth Annual Wings and Wheels. 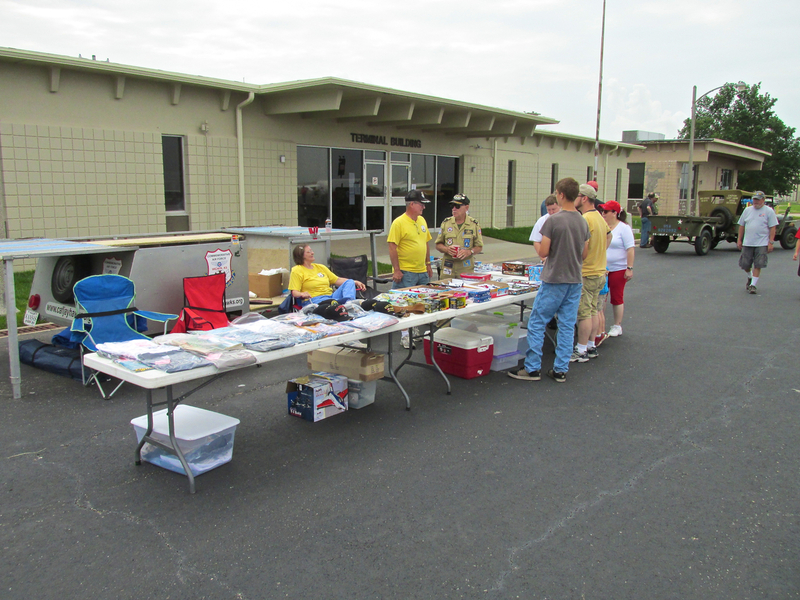 At a couple of Strother gatherings in previous years, the Military Vehicle Club was out in full force. Sometimes they even had enough troops to man a traffic stop. 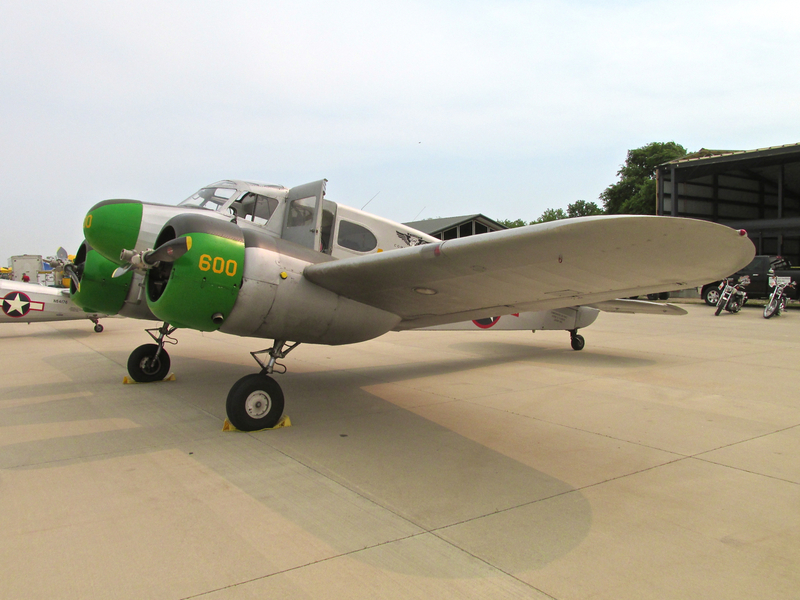 This “W & W”, though, Cessna took center stage while most of the militaria aficionados stayed home. 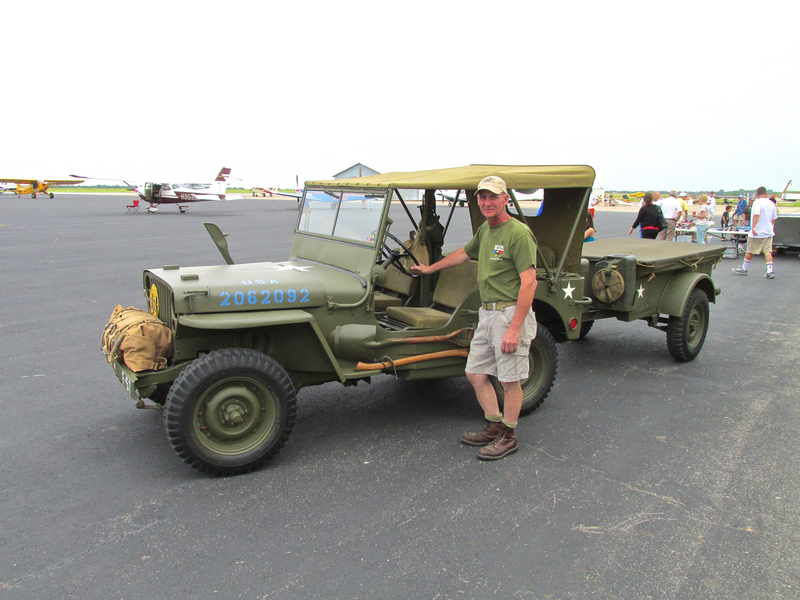 Fortunately, though, Dave Billings arrived with his 1942 Ford Built Jeep complete with trailer and rifle holder. Dave has done his homework on this rig and it is very interesting to behold. I am very impressed with his attention to detail toward this classic of the U.S. Armed Forces. 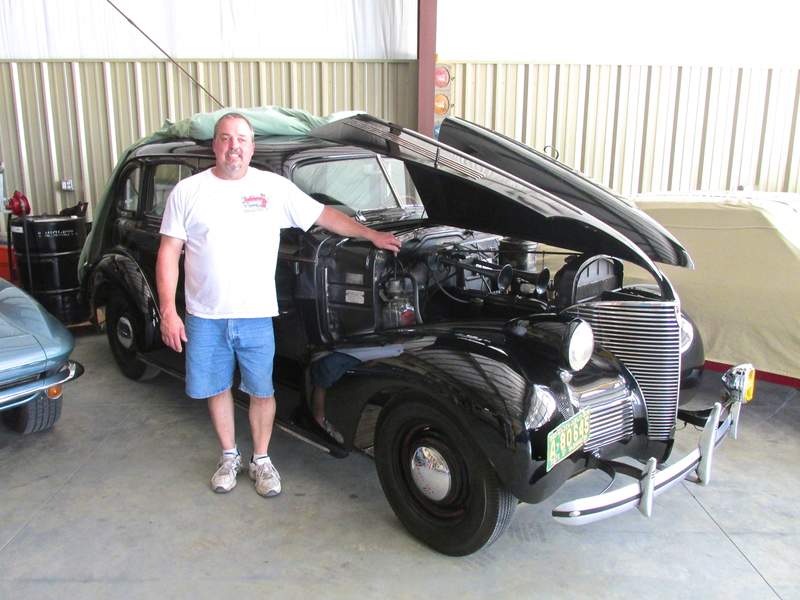 Dave Billings and his 1943 Ford Built Jeep. Overcast skies make for “flat photography”. Outdoor photography in overcast conditions lack highlights to give definition to the pictures. The good thing about the overcast sky that day, though, was the way it kept the tie-down area “liveable”. 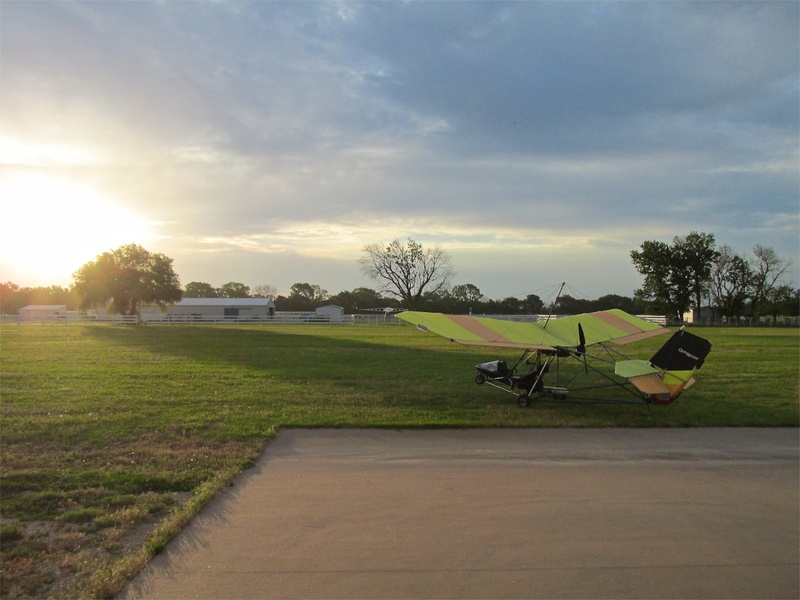 I remember more than one Fly-In at Strother (and other fields) when the sky was clear in June and it was blistering hot on the blacktop. That Saturday was quite pleasant. Things wound down about Noon so I checked the gas and pre-flighted the MXL and was about to pull the start rope when a familiar face appeared over my shoulder. It was Tommy Randall and his buddy Doyle Burgin. 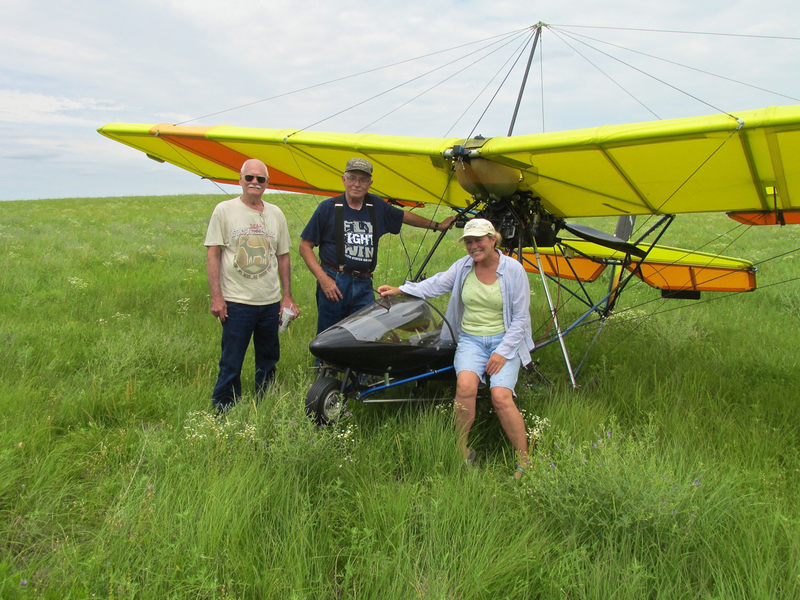 They had arrived a little late for the Fly-In after driving over from Udall, Kansas. 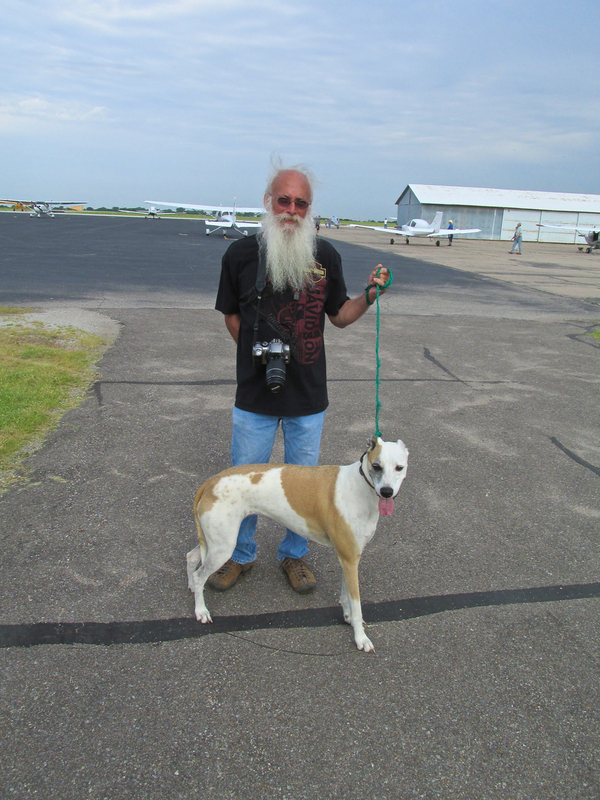 Tommy is a good buddy of mine who lives on Cherokee (Air) Strip just outside of Udall. He was featured in my “Shortcut Story” earlier this flying season. I “stopped the start” and Tom introduced me to Doyle. 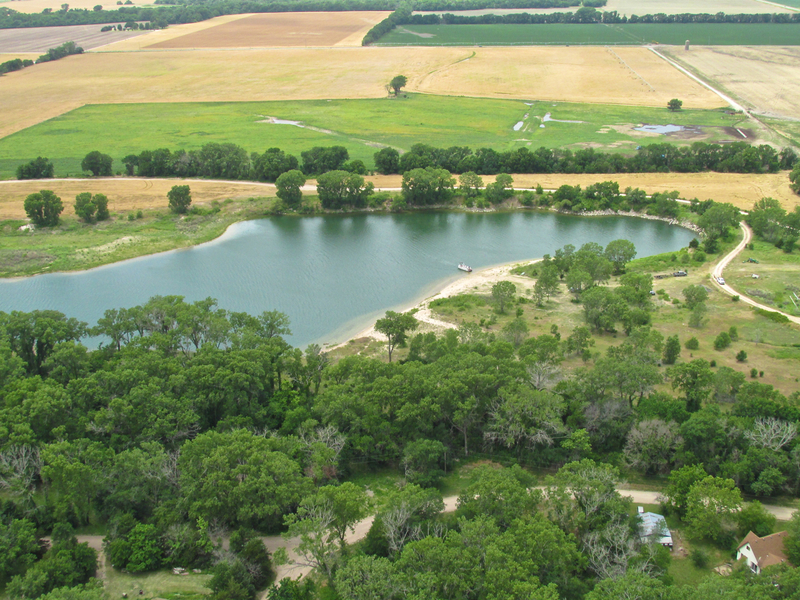 They could see everybody was leaving so they had decided to go over to Maggie Morris’ River Rock Ranch, a rural retreat designed to teach “at risk” youth better life strategies. I had flown over it before to take aerial photos of it after meeting Maggie at Tommy’s place a couple of years ago (story HERE). 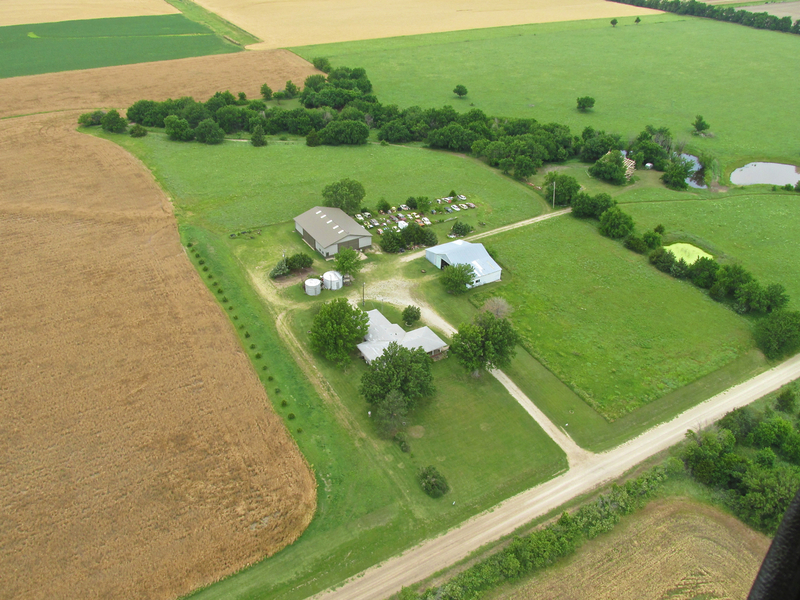 Tommy suggested I detour to The Ranch before heading home and land in the field on the North 40. 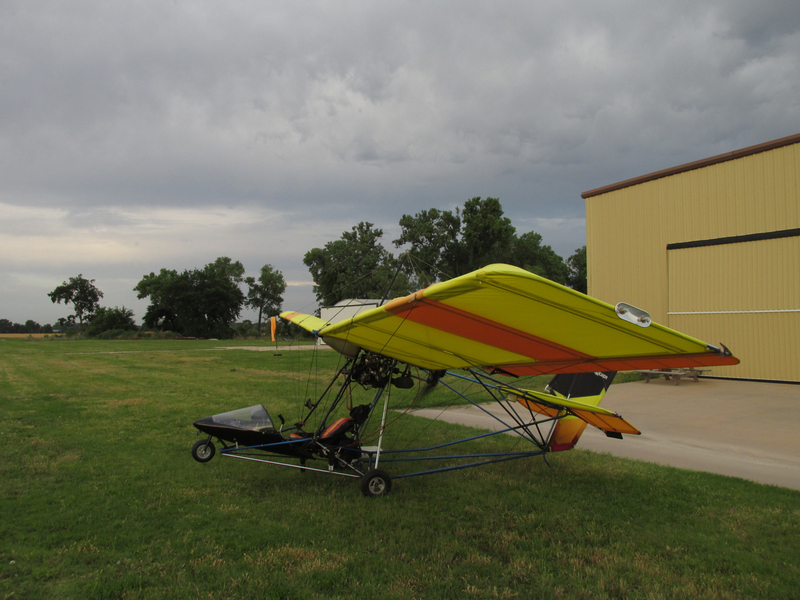 The Sky Surfer, always up for a new adventure said, “Great Idea”, took to the sky, put Strother in the rear mirror and set course for this youth prairie haven. West of Winfield, Kansas I saw this orderly display. 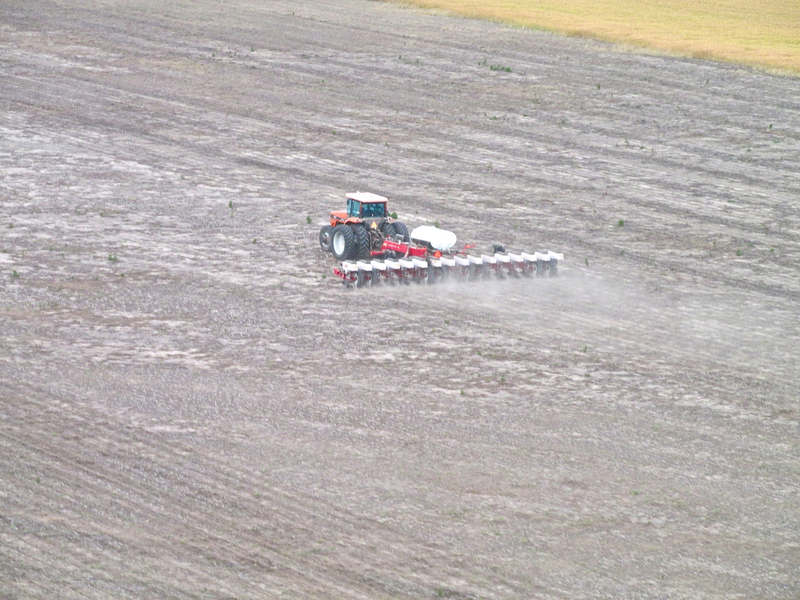 I assume it is some type of test of fertilizer or seed types. Another orderly display but this time of the metallic, four-wheeled variety. 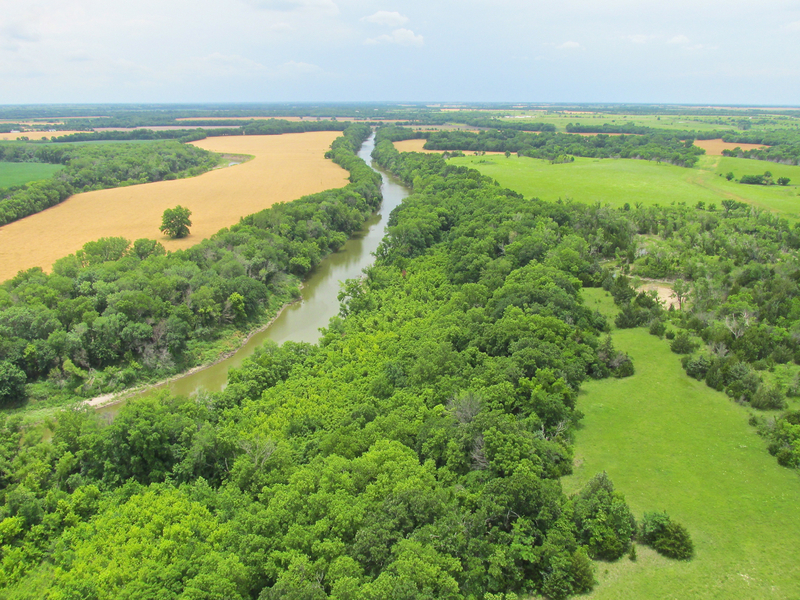 The welcome rains this Spring have been a mixed blessing as they are often carried along in Kansas by high winds and storm activity. This is a good example of why the overcast conditions I spoke of earlier do not help photography. 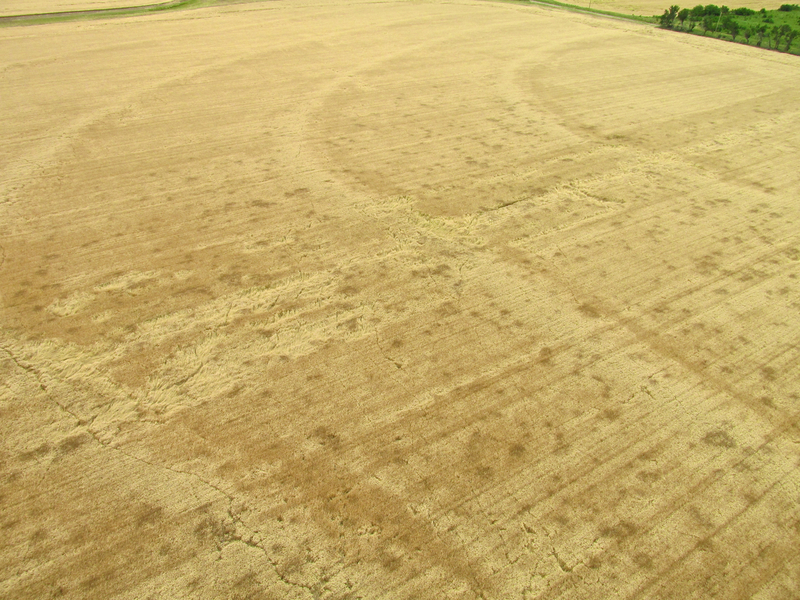 Regardless of the lack of contrast, I think you can still see how the South Wind damaged this wheat. It looks like a river coursing through the field. My understanding is that when wheat is bent down like this, it doesn’t come back up and cannot be harvested. 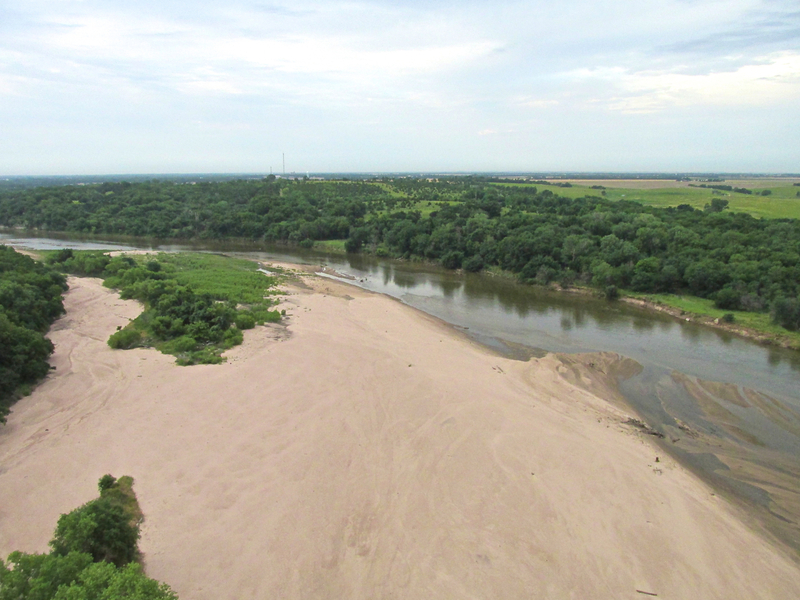 The recent rains brought the river back up. The wind was out of the South, as was my approach, so I swung past The Ranch and then turned back into the wind to get a look at the meadow on The North 40. They had told me it was pretty flat although the prairie grass was about 12 to 18 inches high. The main problem for my plane is surface rocks. The clearance below the axle is only about 6 inches. I made a couple of passes to see what the terrain looked like. While doing this the thought occurred that since the place is called “River Rock Ranch” all the rocks must be down in the gulley and not on the field. That guess was correct. The landing surface was smooth. 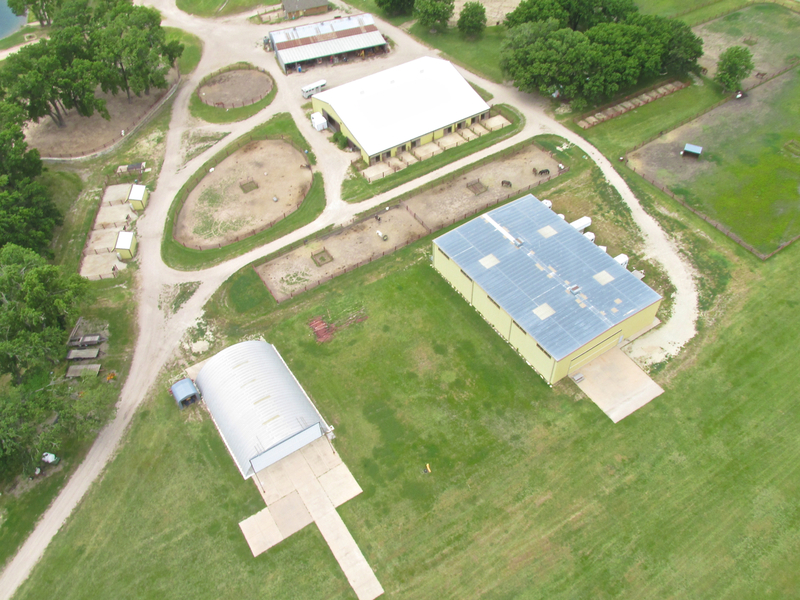 River Rock Ranch from 200′ AGL looking South. I took another picture after the second pass. If you look closely, you can see the three members of my greeting party waving from the grass this side of the red truck. Doyle Burgin, Tommy Randall and Maggie Morris in the grassy meadow of River Rock Ranch. Even before arriving at River Rock Ranch I could see a “situation” building to the South. Kansas weather is quite dynamic. One is best advised to keep an eye on the skies. We talked for a short spell out on the glorious meadow and then I bid adieu. I could not allow myself to be caught on the ground or in the air if hail started falling or a “lightning filled” thunderstorm suddenly overtook me. 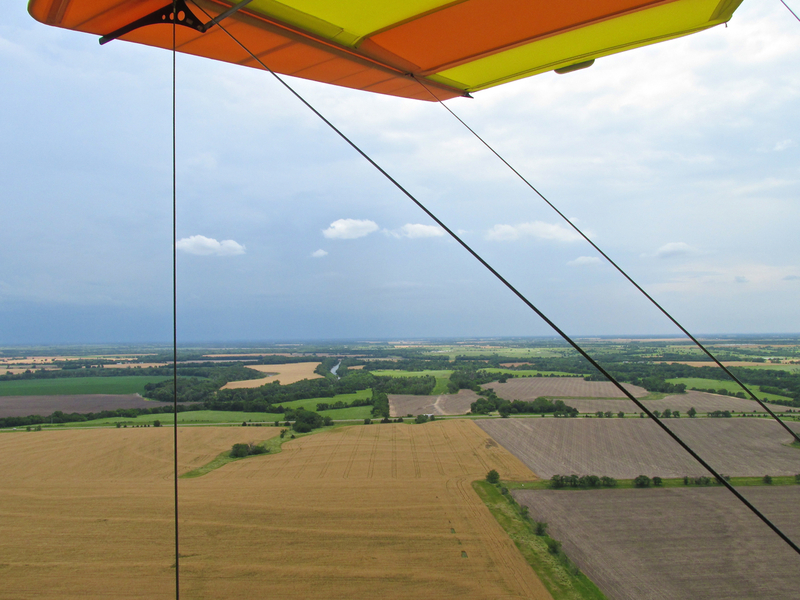 After taking off from River Rock Ranch, I shot this picture under my left wing so you could see the approaching storm. 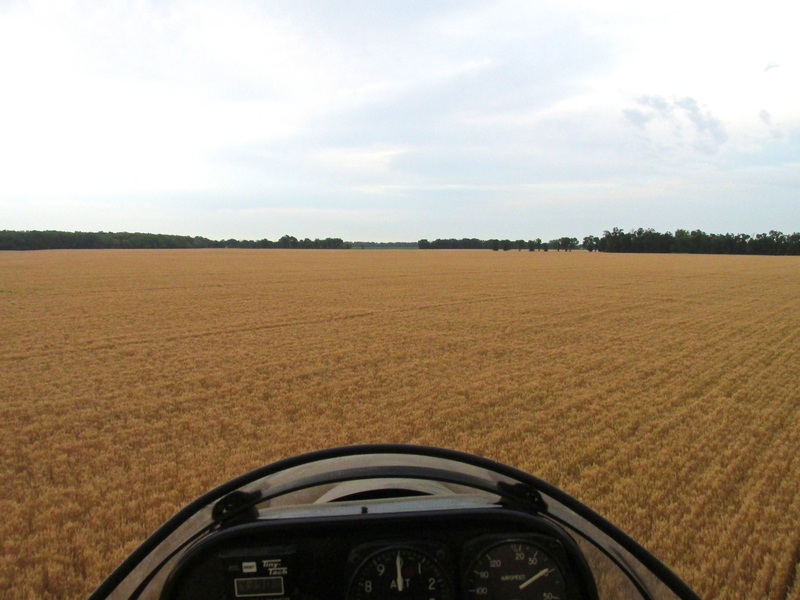 This is looking due South from about 500′ AGL. 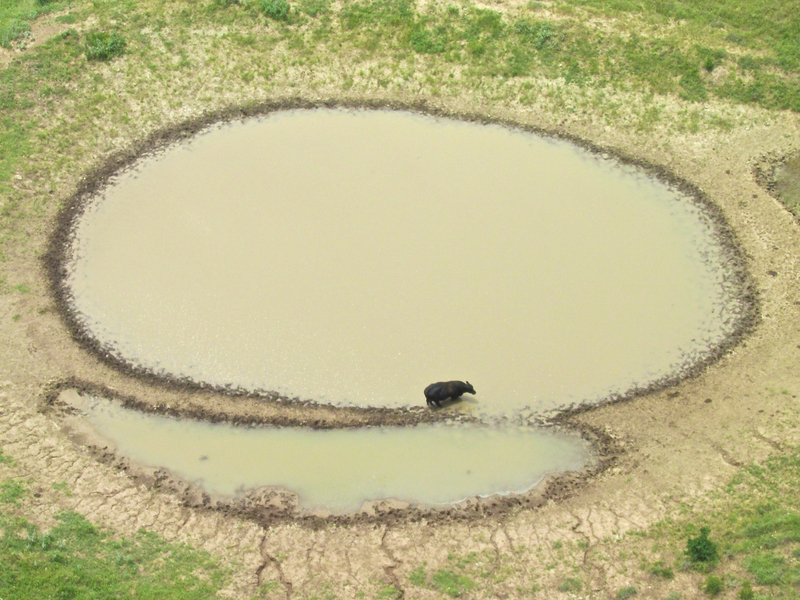 On the way back to Selby Aerodrome, I saw the interesting shape of this Cow Pond and the lone beef in it. I’m sure this spot was bone dry less than a month prior. The panorama ahead was beautiful. In the distance you can see Mulvane, Kansas. I will pass on its Southwest side on my way to Selby Airfield. 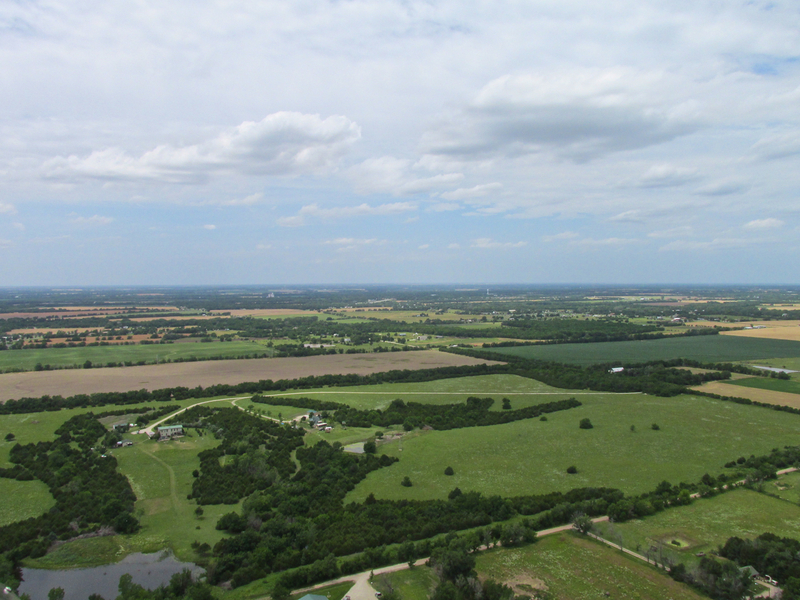 This is looking Northwest from about 800′ AGL. 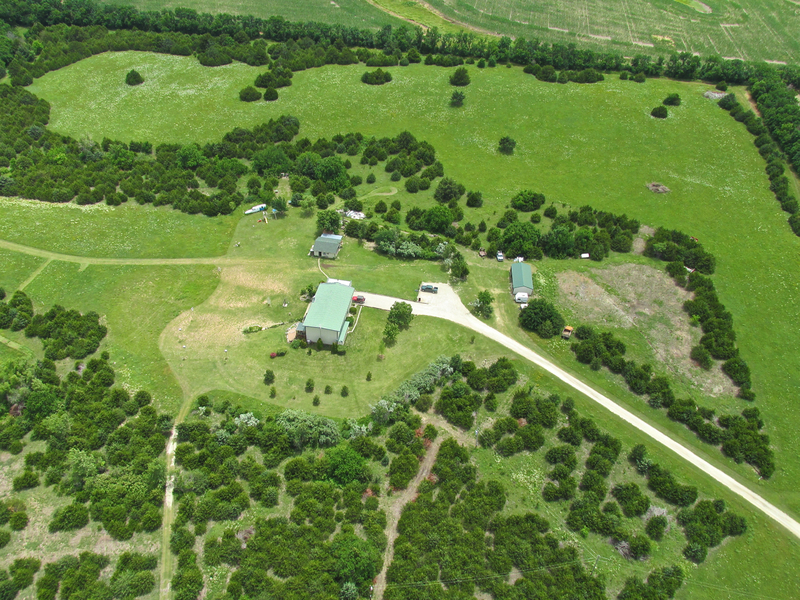 There are plenty of pleasant abodes out in the countryside of Kansas and the one below is no exception. I could never run out of interesting examples to portray. 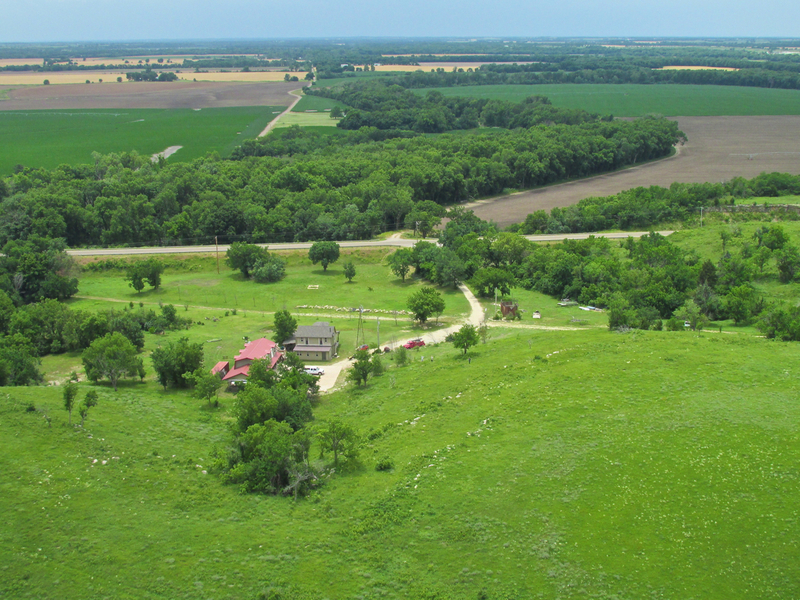 While the shot below IS a good example of Kansas Country Living, that is not why I took the shot. 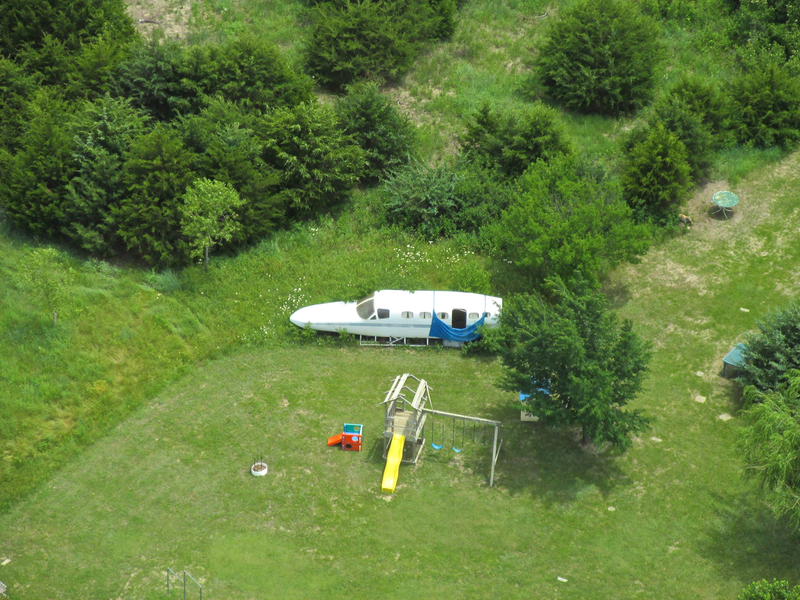 Something “out of place” in this bucolic setting caught my attention. If it doesn’t jump out at you in the wide shot, I have included a tele/closeup shot after it. A playhouse for the kids you won’t see in many back yards! By this time, with the front approaching from the South, it was windy and the atmosphere was fairly turbulent. I took the shot above to show the “dust in the wind” from the truck that had just traversed the road. It gives you a visual of the wind velocity which was about 30 mph and “choppy” by then. 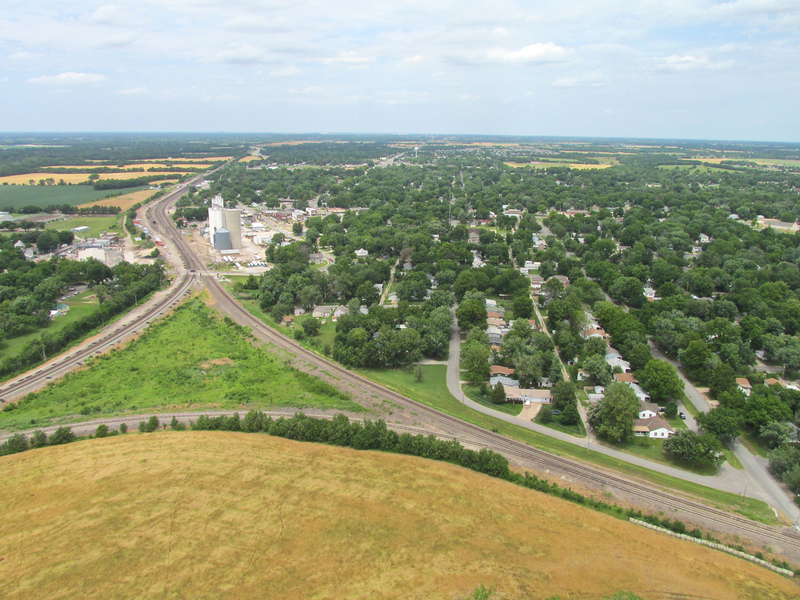 Mulvane, Kansas from 500′ AGL looking North. Freight trains course through here constantly. 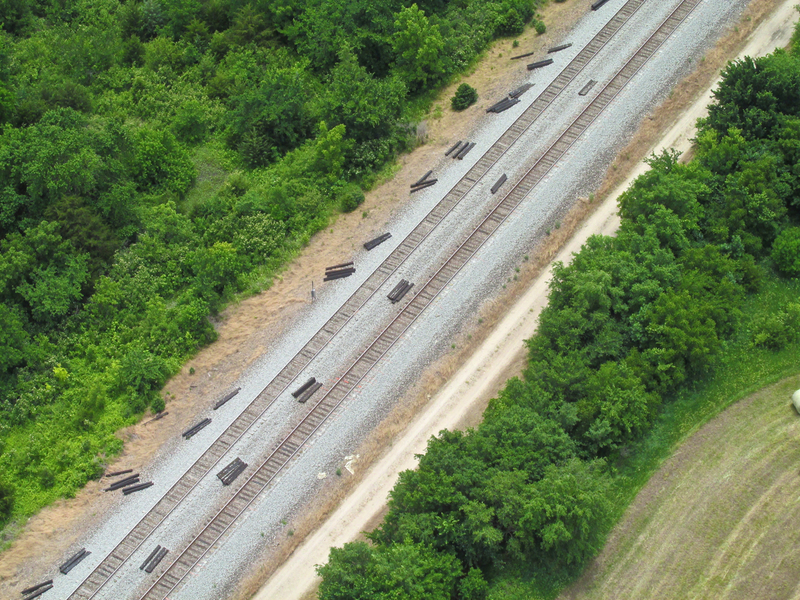 As I took this picture I noticed ties spread along the track on the left. Below is the track that in the previous picture was going down and to the left. It is heading Southwest. 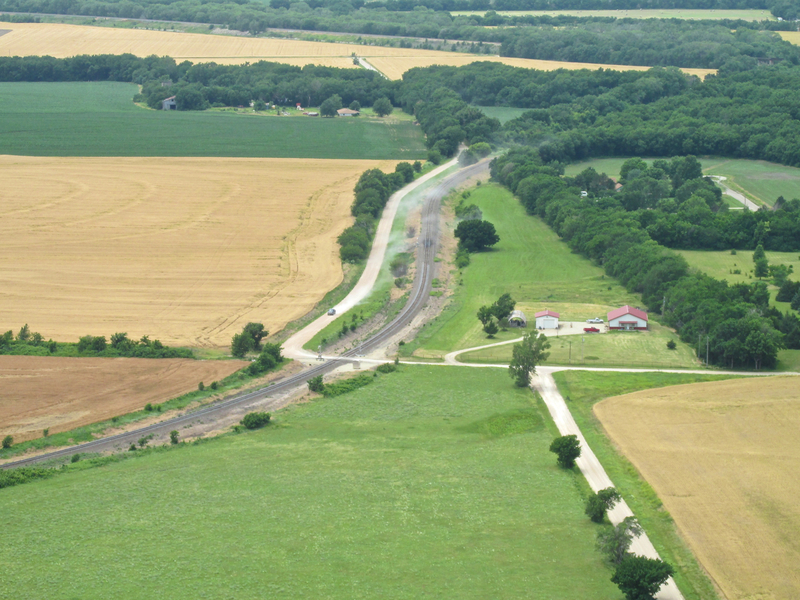 I think it is connected to the line going through Wellington, Kansas. I featured that part of track in a previous story showing the repairing machines and what they do with these new track ties. You can see it HERE. 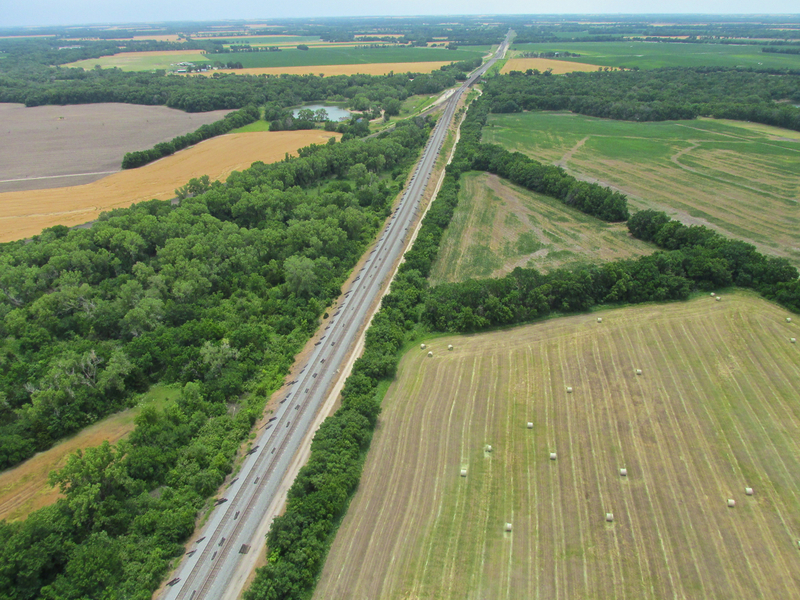 From the South Side of Mulvane looking South from 500′ AGL. This lake is West of Mulvane about a mile. A family is bringing their flat bottom boat to shore after a ride around the lake. 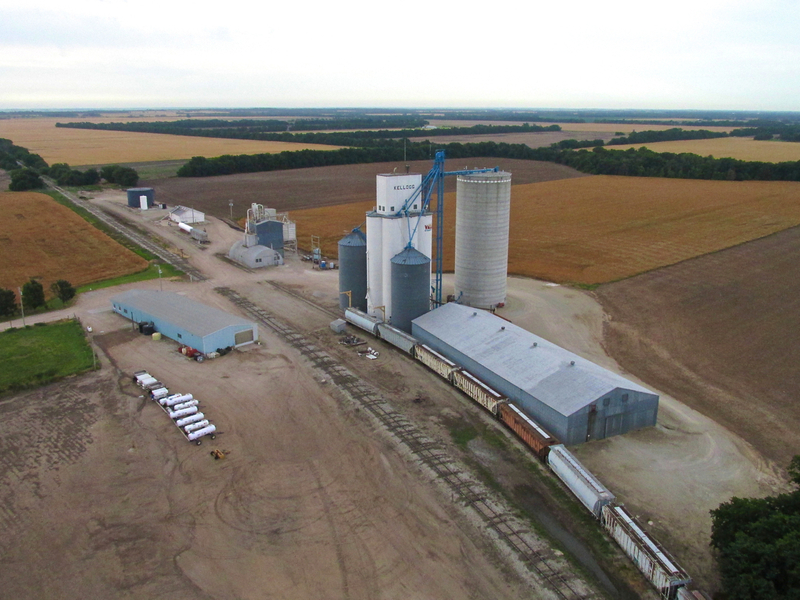 Looking West from 300′ AGL. Even though the sky was darkening behind me, everything looked idyllic to the North. What the photo doesn’t reveal is the turbulence I was flying in. It was getting pretty rough – a herald of the oncoming storm – and it was time for me to put the steed in the stable. 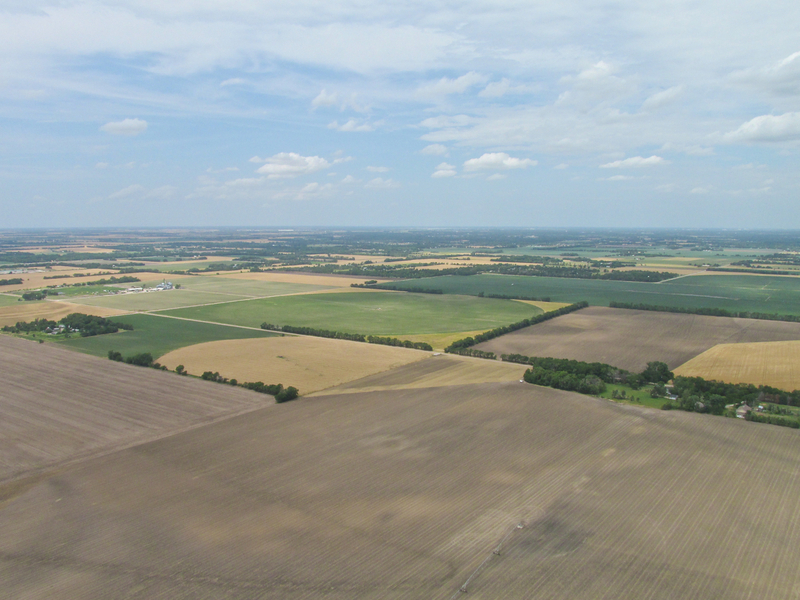 Taken 3 miles West Northwest of Mulvane from 800′ AGL looking North Northwest. 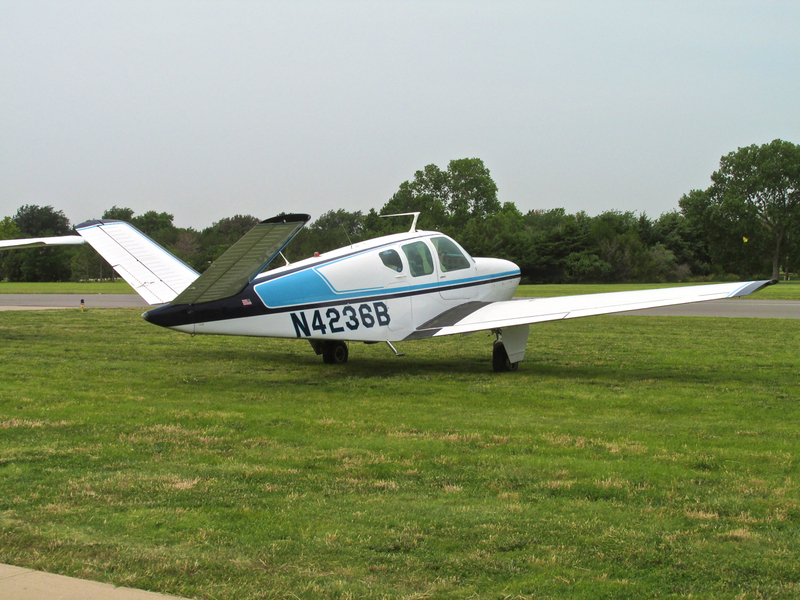 When it gets turbulent, my MXL behaves like a bucking bronco. The key is to let it “buck” without fighting it while at the same time directing it where you want. I debated whether to include the shot below because the shutter was too slow and the jarring movements of the plane made it “smear”. Nonetheless, I included it so you could see the position of the windsock. It was swinging wildly from Southwest to Southeast. At this moment it was swung all the way West. 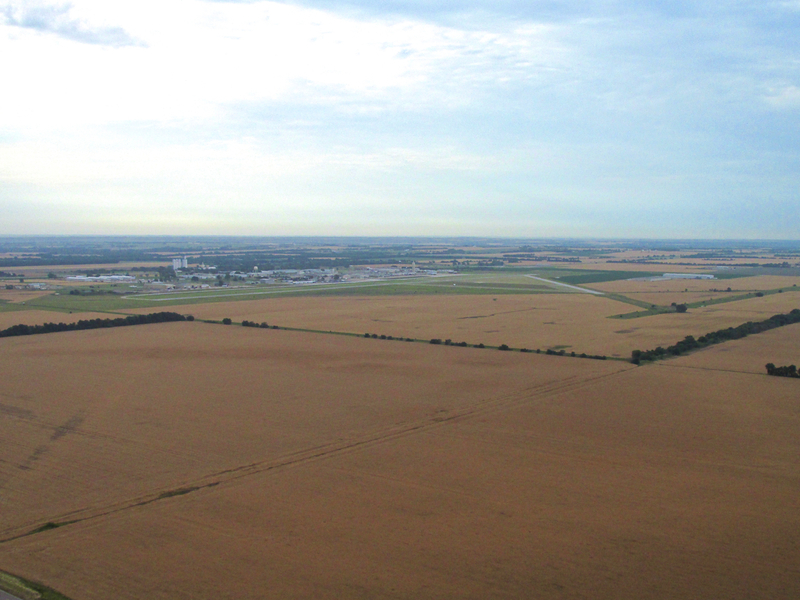 Selby Aerodrome and Stables from 100′ looking West while passing downwind over the runway. Before putting the MXL in the hangar I took this picture so you could see the storm approaching from the South Southeast. Now that’s some good contrast! 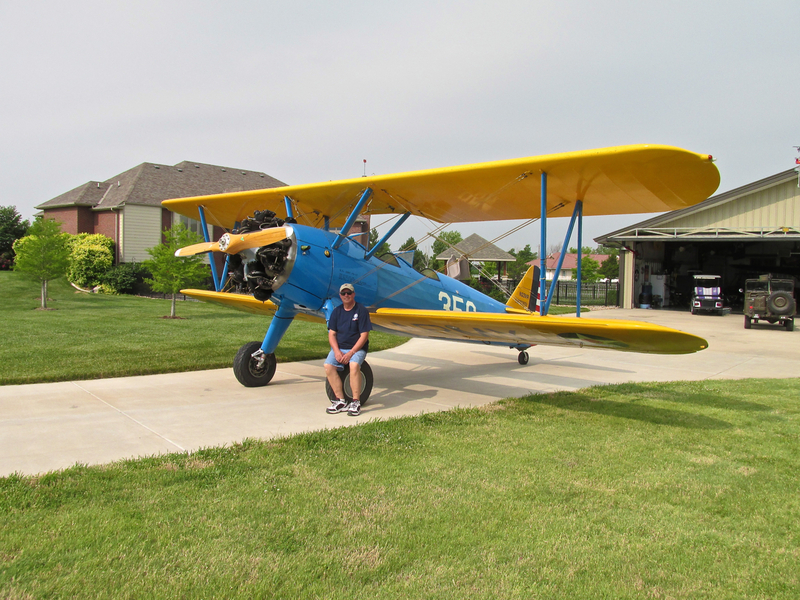 On the following weekend (22 June 13), I attended The Stearman Field Fly-In at Benton, Kansas. Due to a combination of events I did not fly to it, though. I had a maintenance issue on my Quicksilver that I had worked on until 9:30 pm the previous evening. By the time I finished it was pretty dark in the hangar and I did not want to rush a flight the next morning until going over the repair in better light. Also, it looked to be a very windy day with wind from the South. The previous year’s Stearman Field Fly-In (story HERE) had similar conditions and with a 30 mph headwind it took me forever to get home after the event. 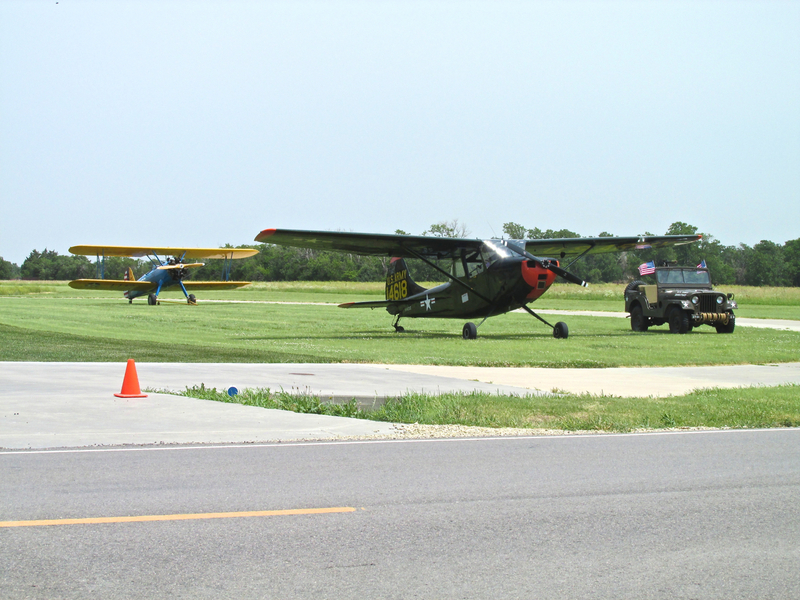 Either one of these issues could have been overcome but due to the combination of them I decided to drive over and check Stearman Field Fly-In as a “ground-pounder”. 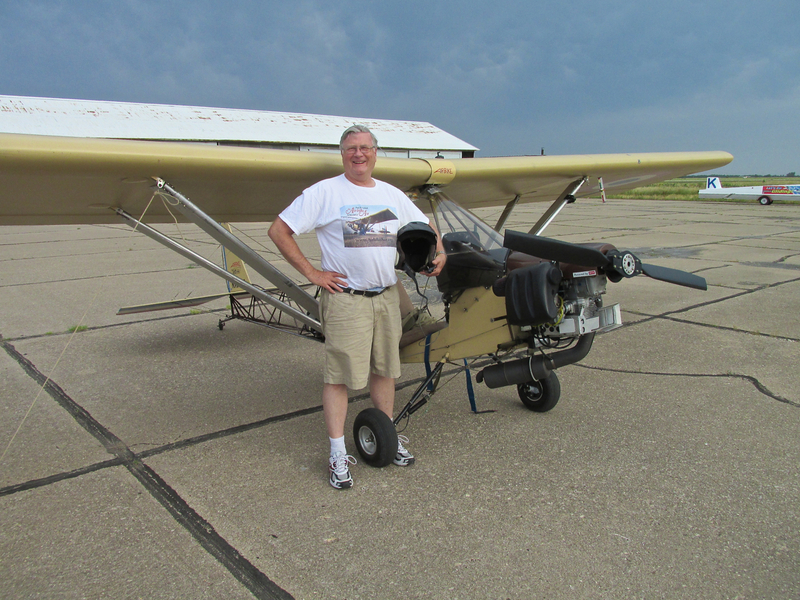 The main reason I was going to the event, though, was to see my buddy Victor Riffel and to give him a copy of the latest installment of my series on Vintage Airplanes – “That They Might Fly Again – Part 3“. 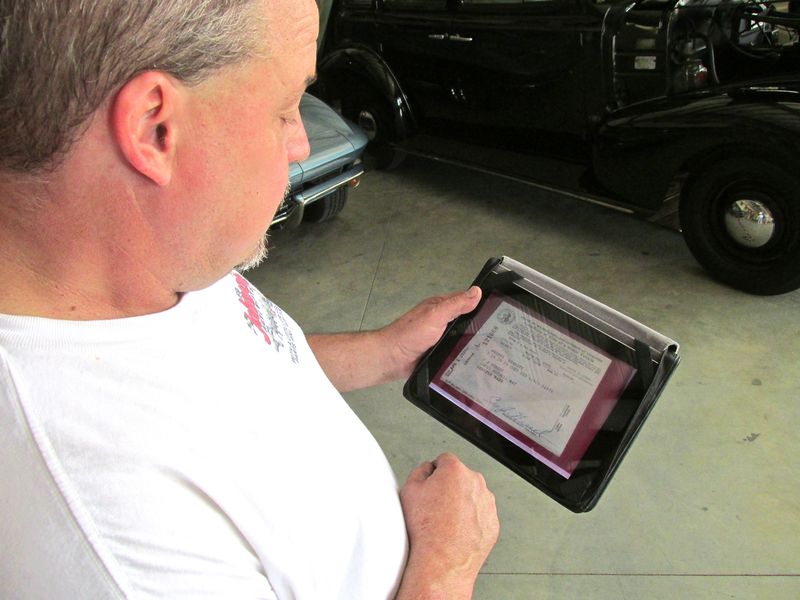 Victor is one of the interviewees in the movie and we talk about his Stearman BiPlane. 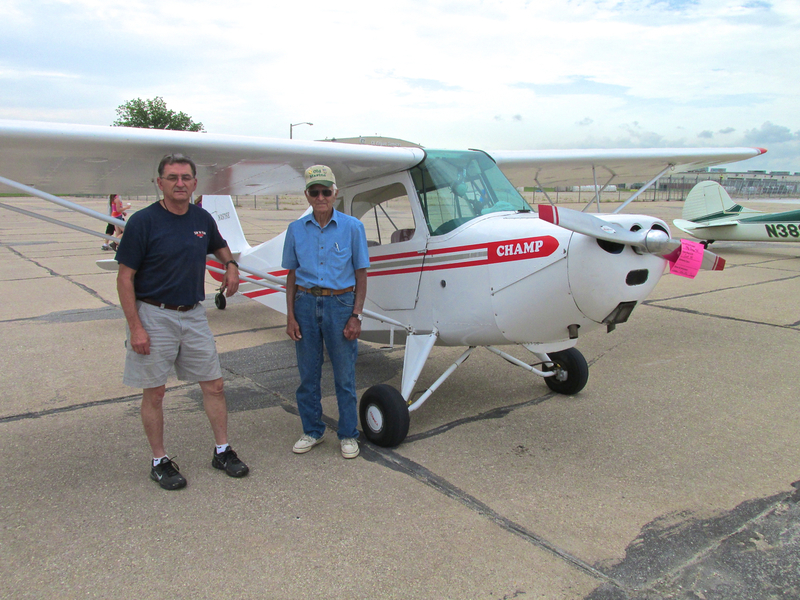 Victor and his family live on the Stearman Field runway. He has his two airplanes in a hangar adjacent to his house. 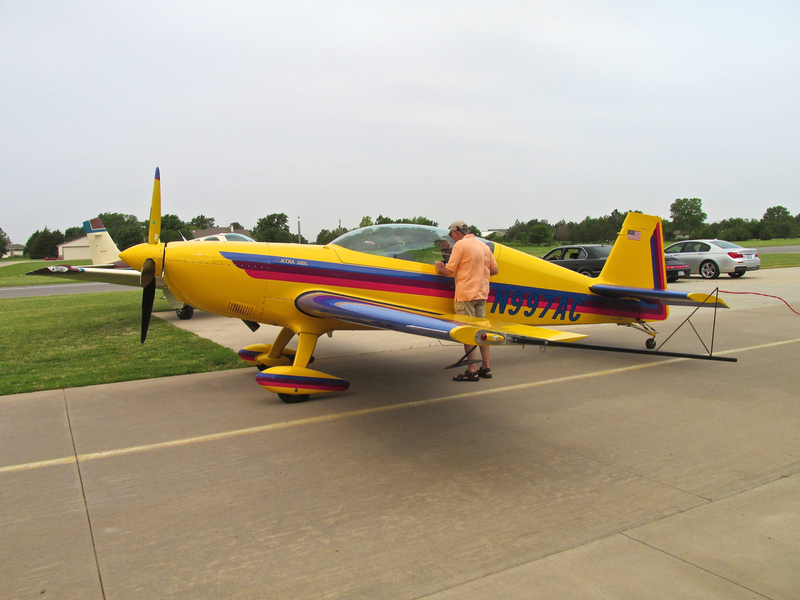 After parking my car at the airfield, I looked over and saw Vic moving his Stearman out. I walked over to say hi. 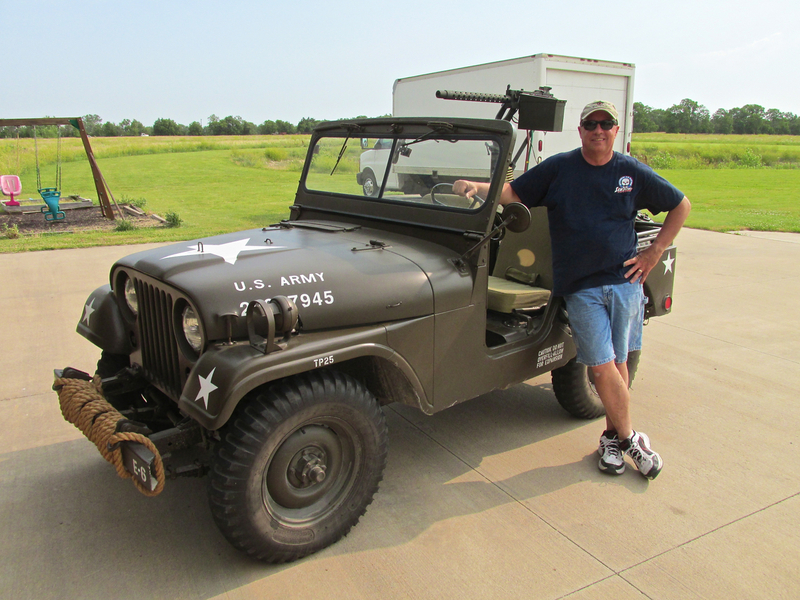 I discovered Vic also has this Classic WWII Jeep to protect his hangar full of planes. 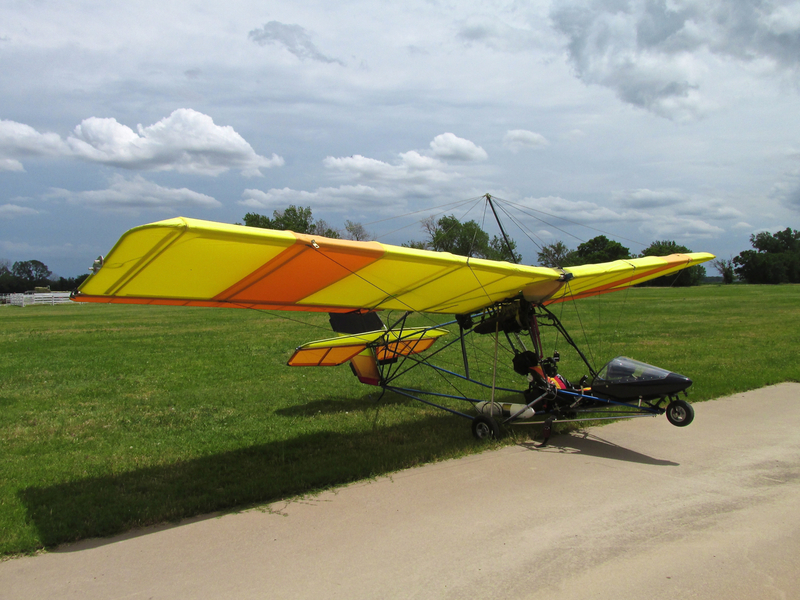 Back in the 1980’s when I began flying Ultralights, I hangared my plane for a while in the “T-Hangars” that were prevalent at the field then. 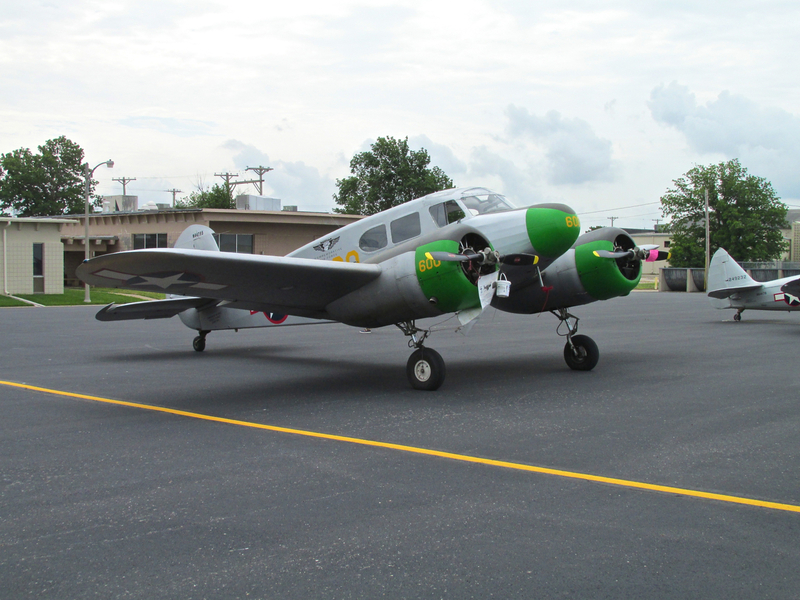 Then it was Benton Airport. Although he has subsequently sold his ownership position, Victor and some partners bought the airfield renamed it “Stearman Field”. Although the name is famous around the world for the plane it represents, another reason I suspect for the new name was to reflect the preponderance of these venerable machines hangared there now. 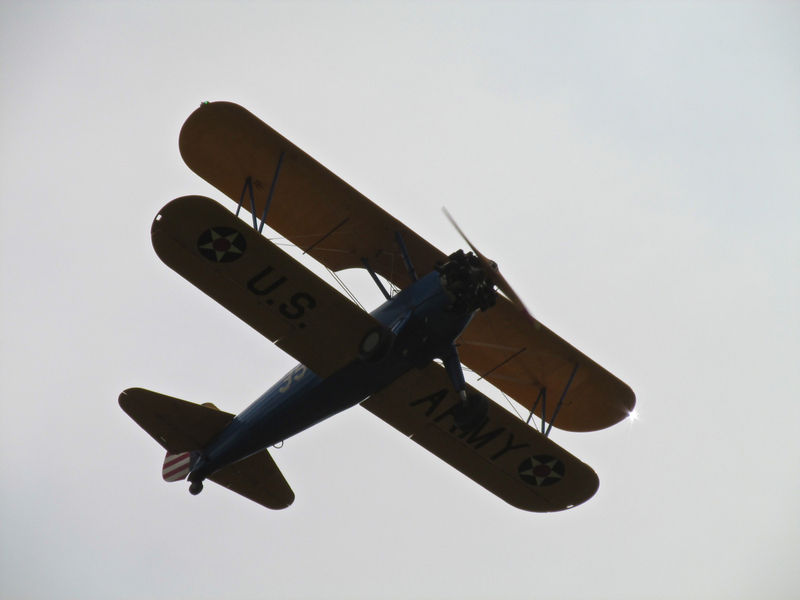 As Vic and I were talking on his driveway, a couple of Stearmans were in the pattern giving rides, passing over our heads continually. The overcast sky was lit strongly by the sun rising in the East. That condition provided the right confluence for a neat silhouette of this Stearman on final. Victor was busy getting his stuff ready for display so I told him I was going to look around the action across the street. He insisted I use his Golf Cart. 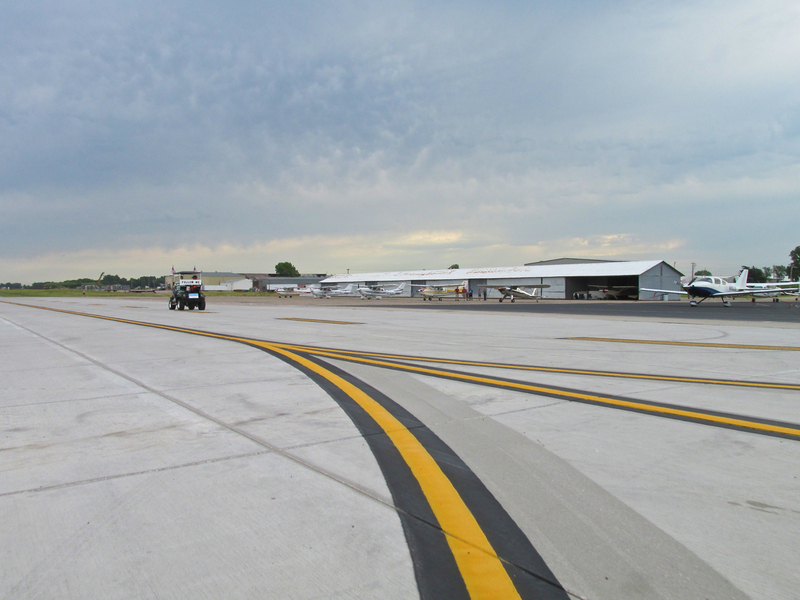 I decided that would make it easy for me to traverse the mile long runway to show what Stearman Field is like these days. Soon Vic had his toys out on display. 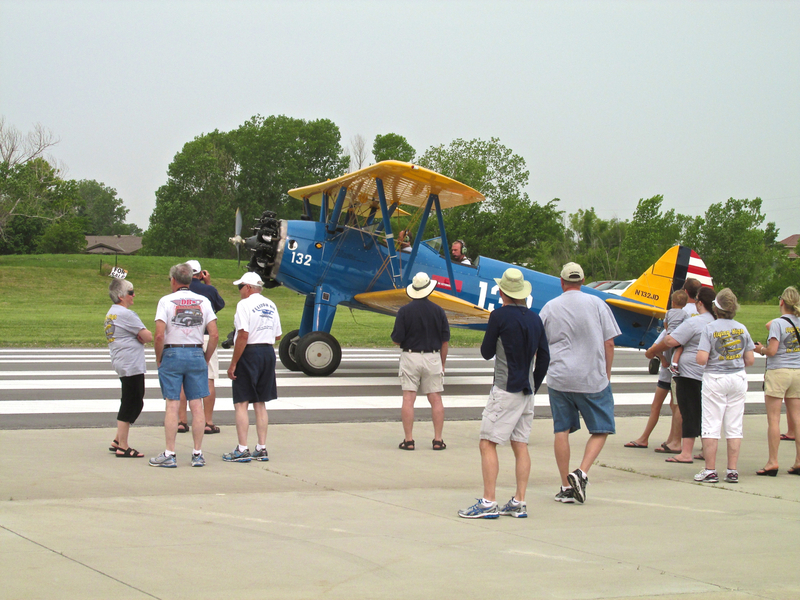 There is always a lot of action at Stearman Field through the week and particularly on Saturdays but because this was the Annual Fly-In, it was particularly busy that day. I had to be alert to catch some of it on camera. 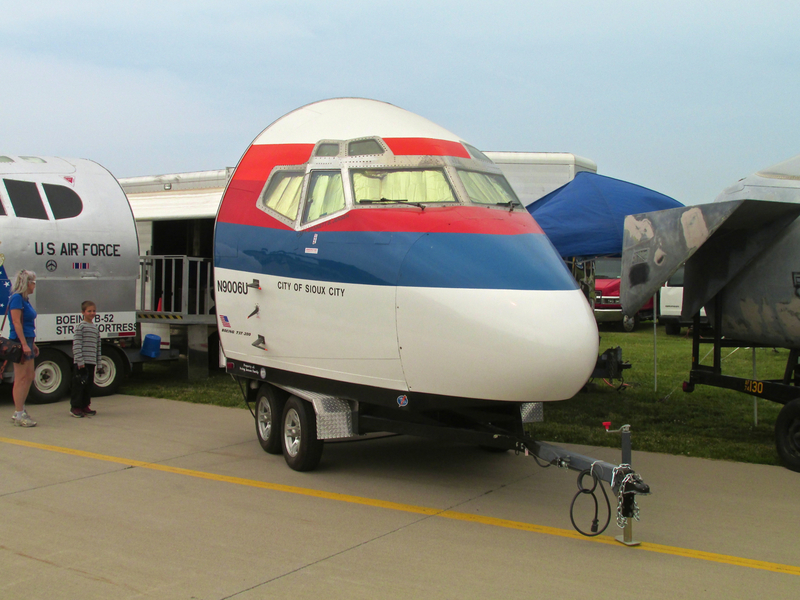 Airshow goers will recognize the “high performer” seen below. 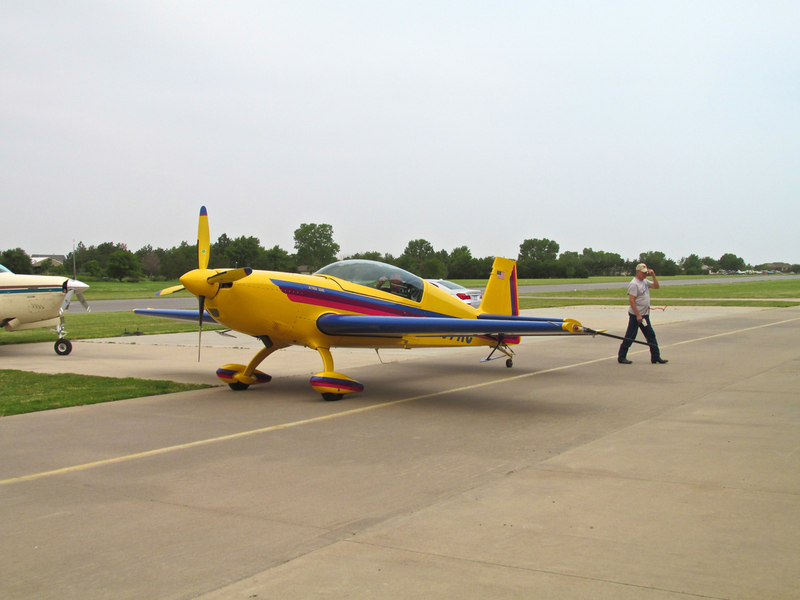 A 2004 Extra EA 300/L Aerobatic Plane just after rolling out of a hangar. 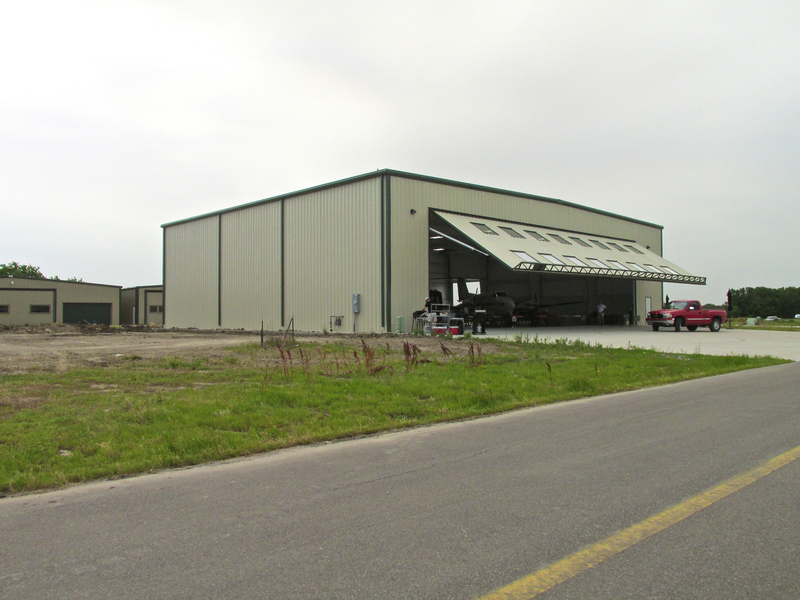 One of the newer “Hangar Homes” that have recently been built on the field. This one has a hydraulic door. 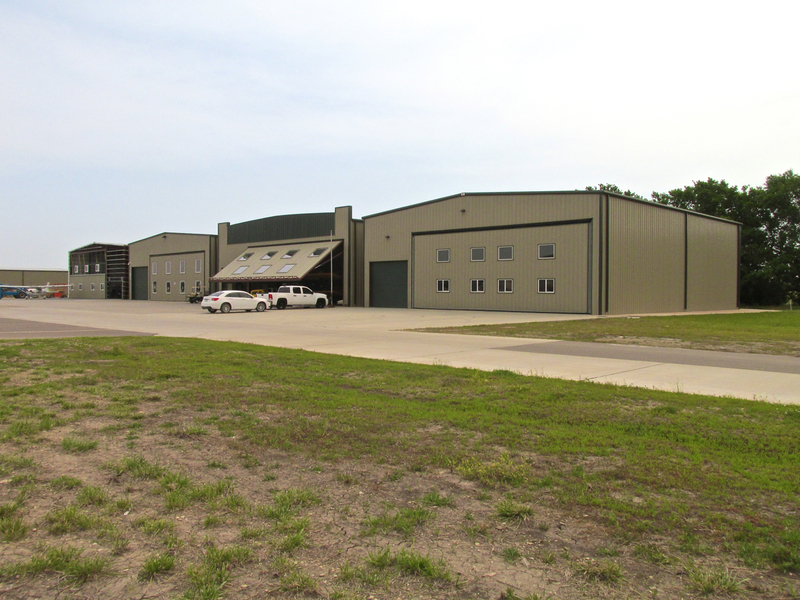 Just North of the previous picture are these other examples of the Hangar Home Concept. On the West side of the runway are some traditional homes with hangars next to them. 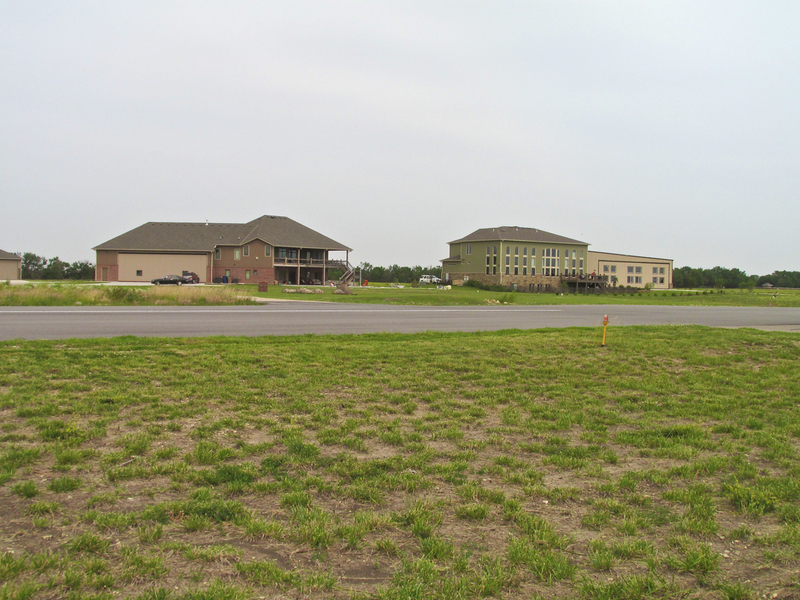 Another group of Hangar Homes on the East side of the runway. I had never seen one like that in the middle with all the windows. Lots of natural light. This was shot close to the North end of the runway on the East side looking North to feature the transient tie down area. There is an aircraft on final. The pattern was quite busy that day. Like I said in the Strother Field report, the CAF doesn’t let dust settle on the wings of their planes. 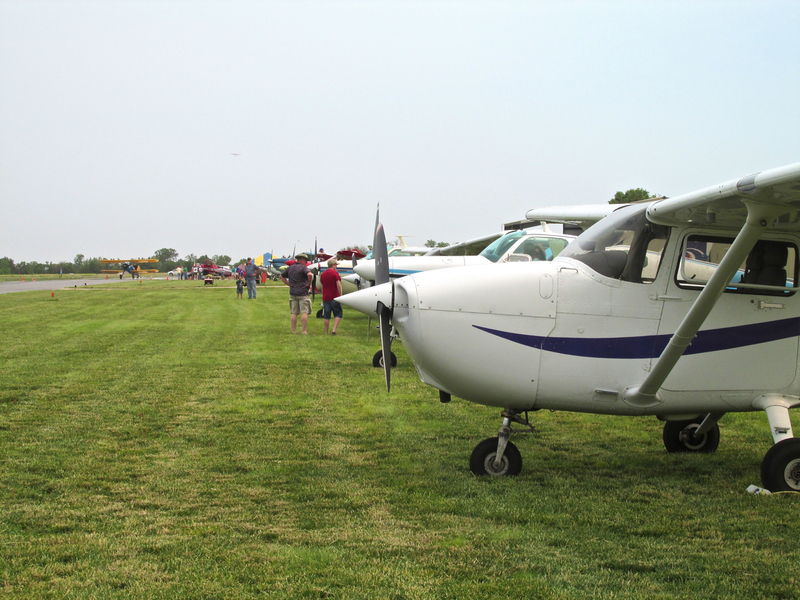 They get out to the Fly-Ins and Airshows across the region during The Flying Season. 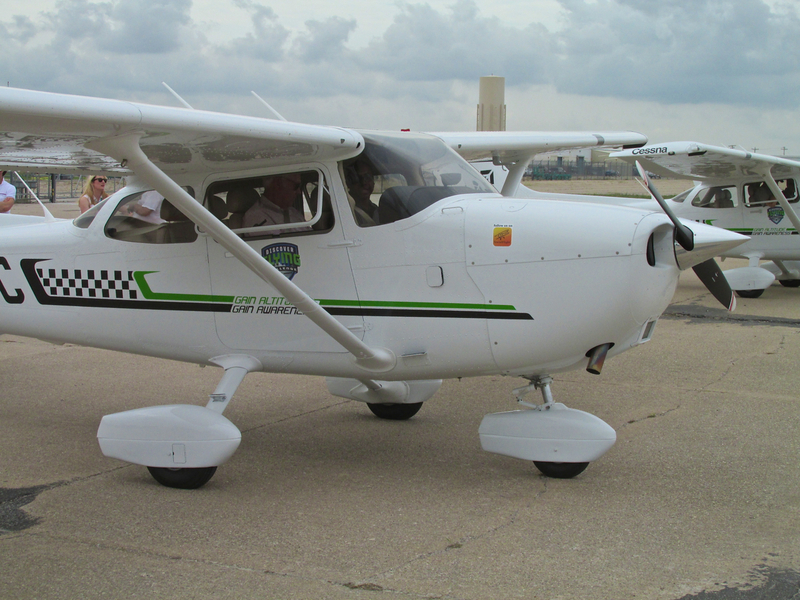 Here is their Cessna Bobcat with the Fairchild in the background. Definitely a Show Stopper. 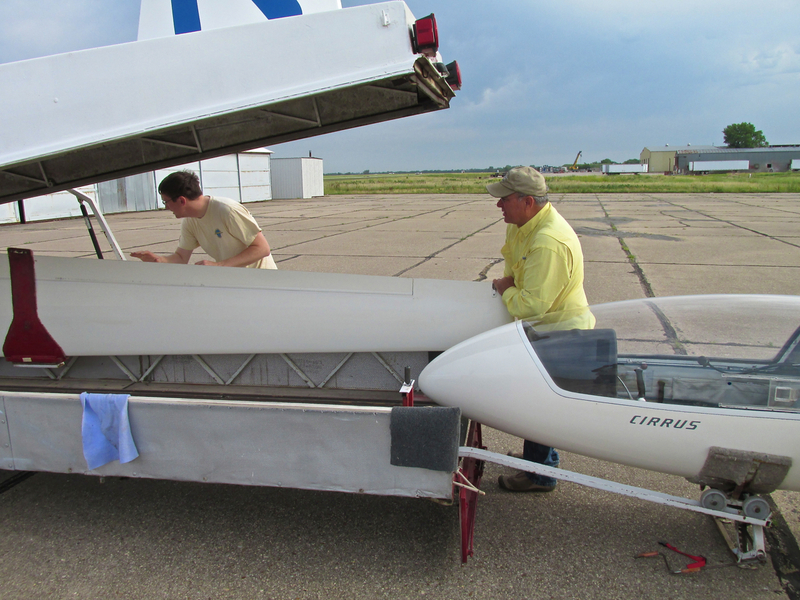 This is a Brand New 2013 YMF-F5C Waco in town for the installation of flat panel navigation aids. The owner lives in California and it was to be ferried there after the Fly-In. 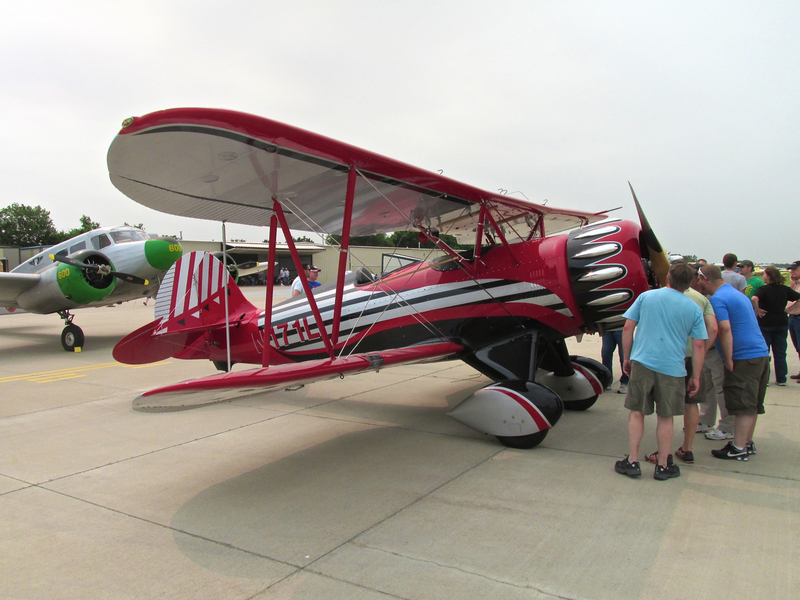 This Stearman kept busy continually providing rides. I didn’t look close enough while I was there. 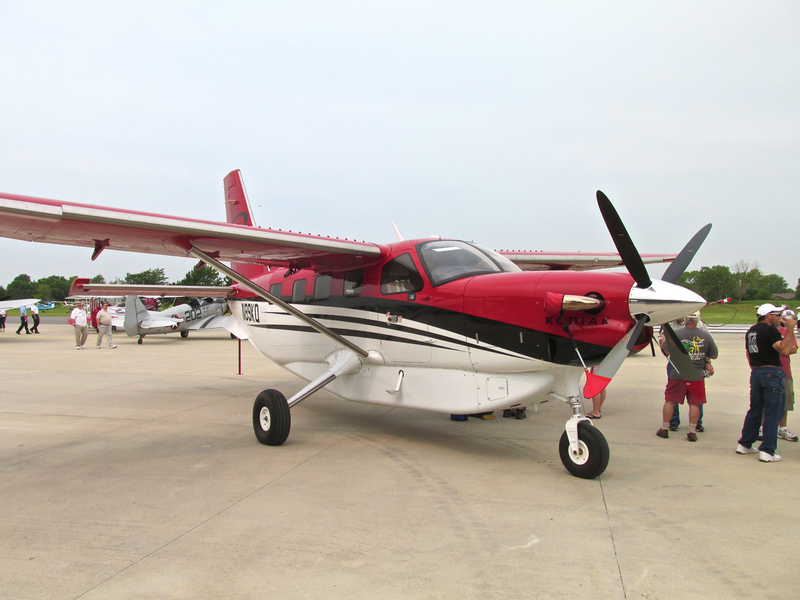 When taking the picture I thought this was a Cessna Caravan but it is listed as a Quest Aircraft Company 2013 Model KODIAK 100. Quite a plane. 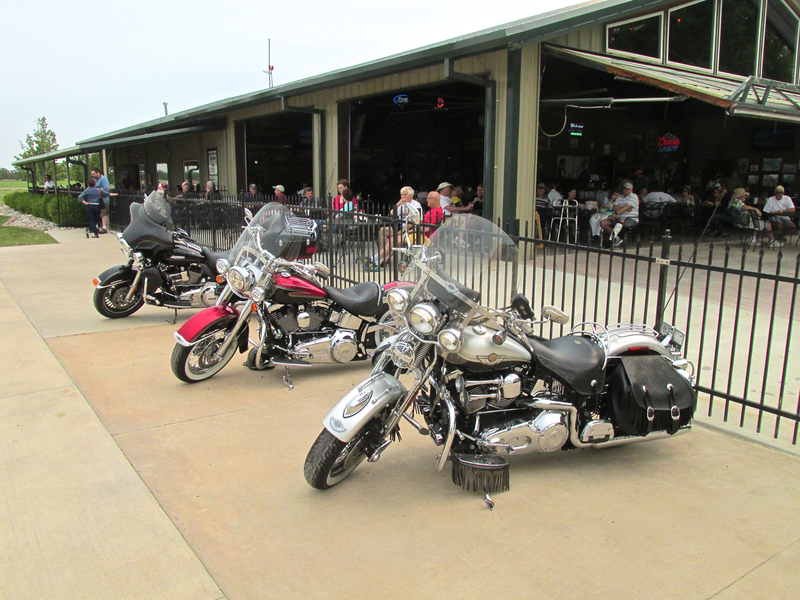 The Stearman Field Bar & Grill has the unique ability to raise three “walls” to quickly convert to outdoor dining. Some nice bikes showed up. Check out the fringed foot pedals and saddlebags in the foreground. 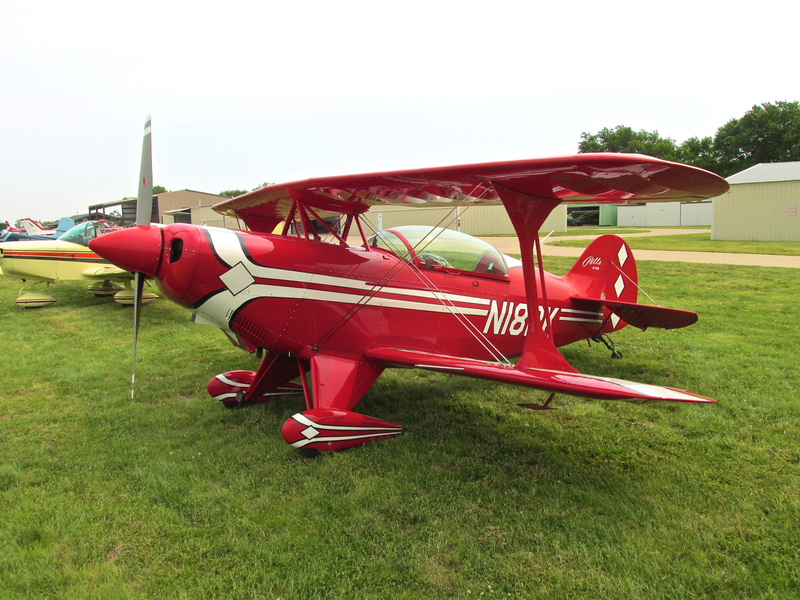 A special embellishment to the Fly-In was the appearance of several of Nu-Tek Simulation’s airplanes. President Steve Cannaby and I have been friends for over twenty years. Quite the entrepreneur, Steve keeps a lot of balls in the air. 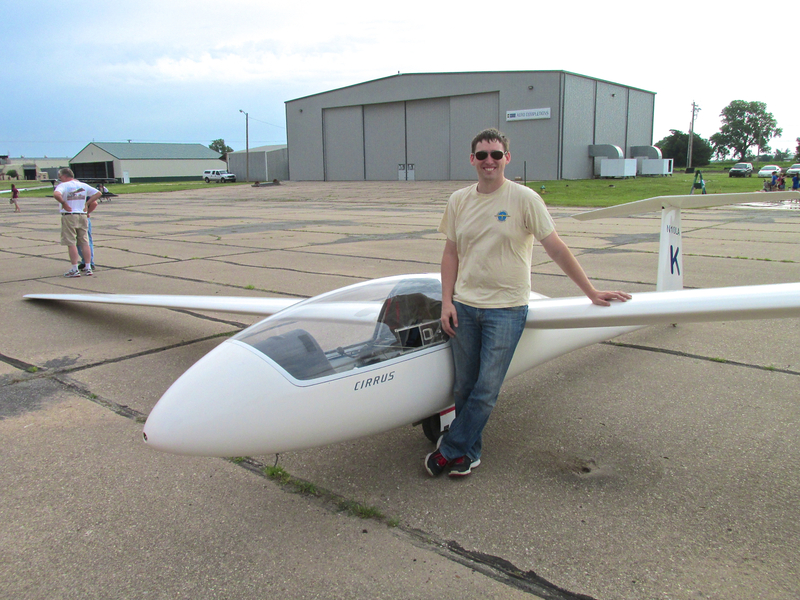 In addition to his aircraft instrument company Nu-Tek Aircraft Instruments, he also has Nu-Tek Simulations. 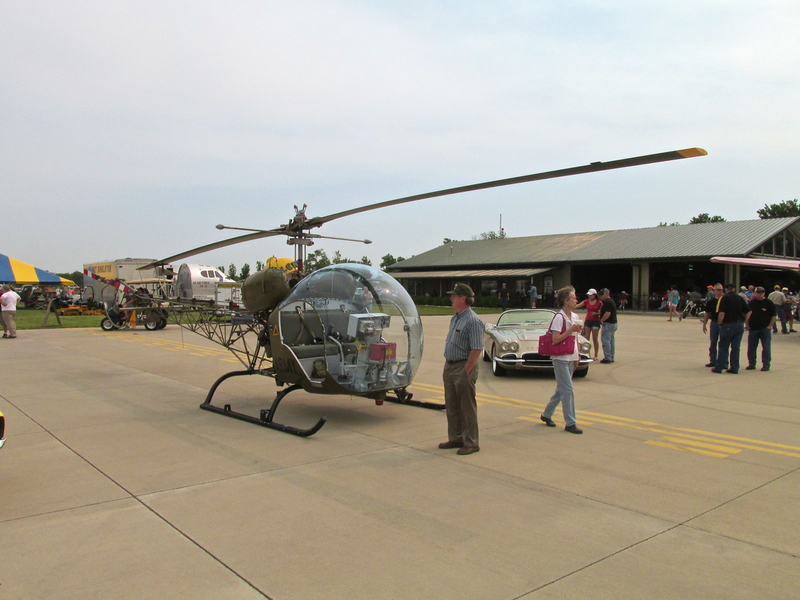 They brought a number of simulators to Benton that day. 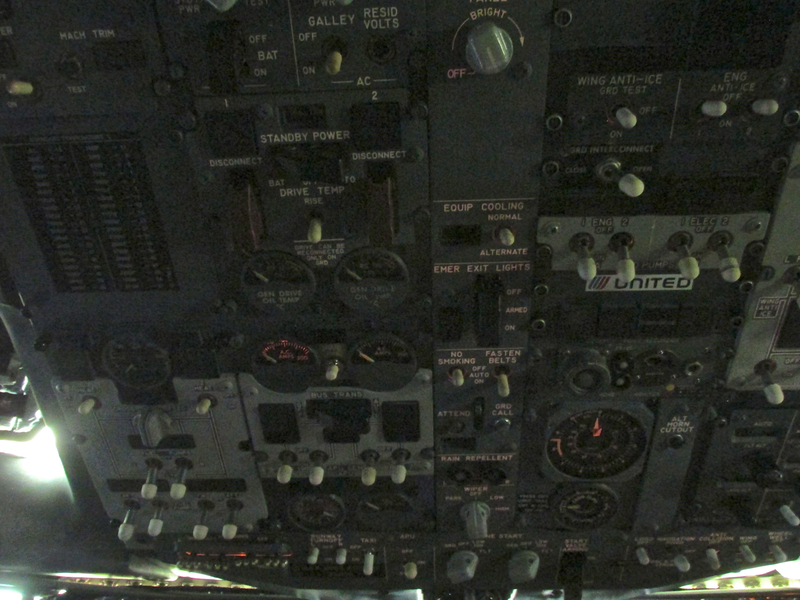 One of their more advanced simulators is the Boeing 737. 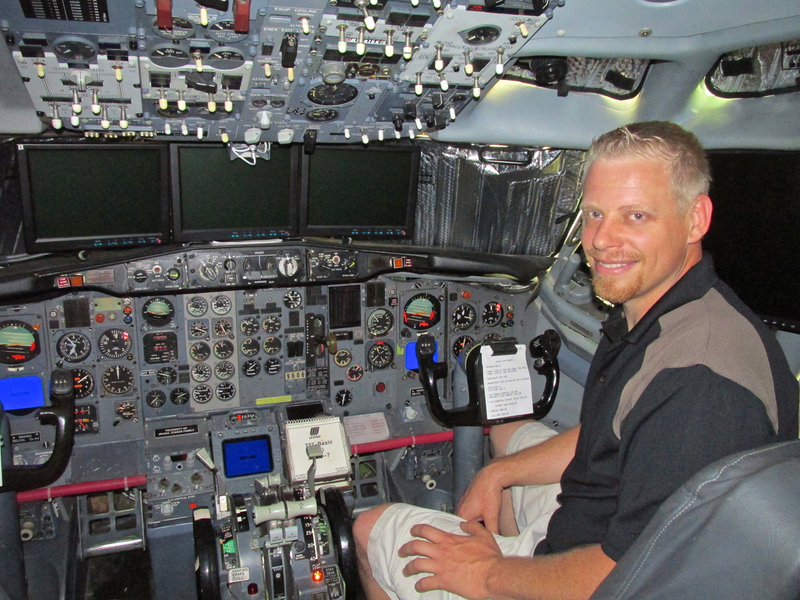 Simulation Manager Justin Messenger talked me through a flight. It is very impressive. Justin has done an amazing job interlocking the controls and instruments to a computer program for the simulation of flights into and around known airports. The audio is good, too. A view of the overhead section. 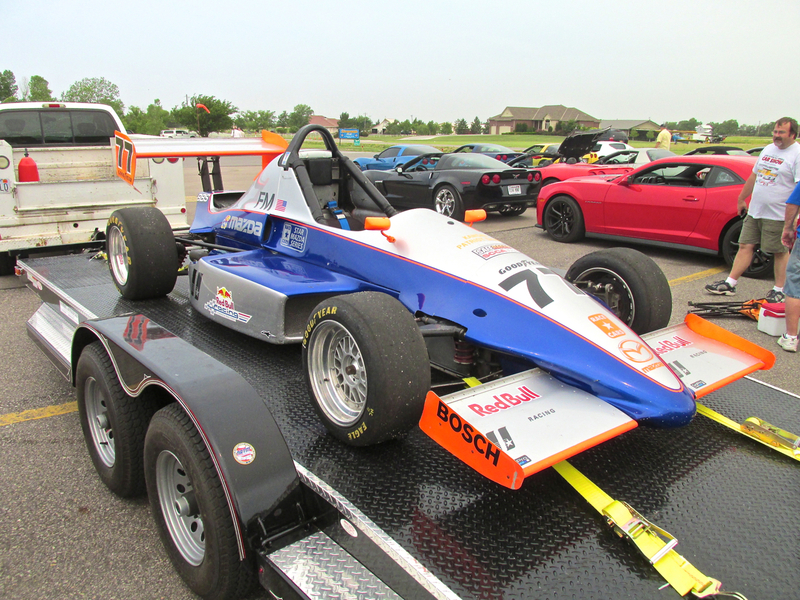 I talked with the owner of this racer. It represents a special class that was popular a few years back but is no more. Everyone in the race had to drive cars identical to this. 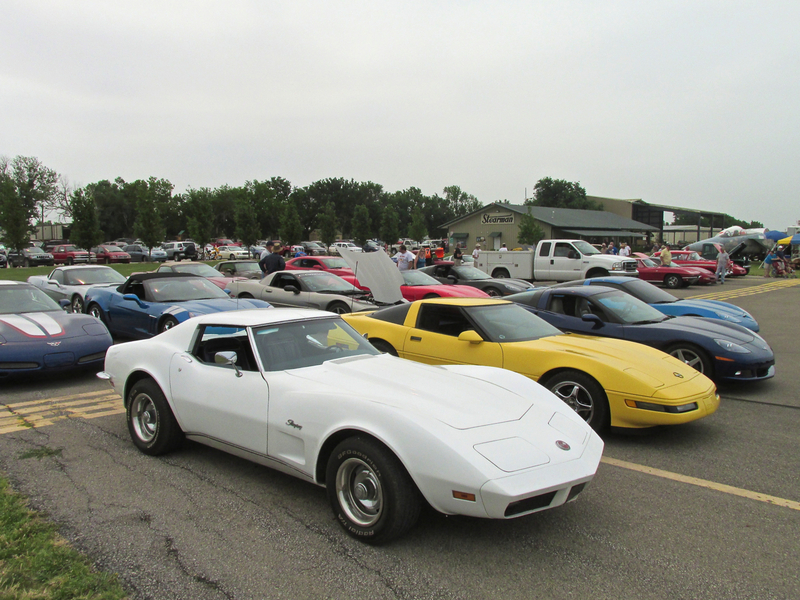 Members of the local Corvette Club brought their cars to display. Nice roadster! Unfortunately I did not get this gentleman’s name but he “learned me” something new. The “wraps” you see on the engine headers actually increase the performance of the engine by regulating the heat to scavenge the cylinders better. 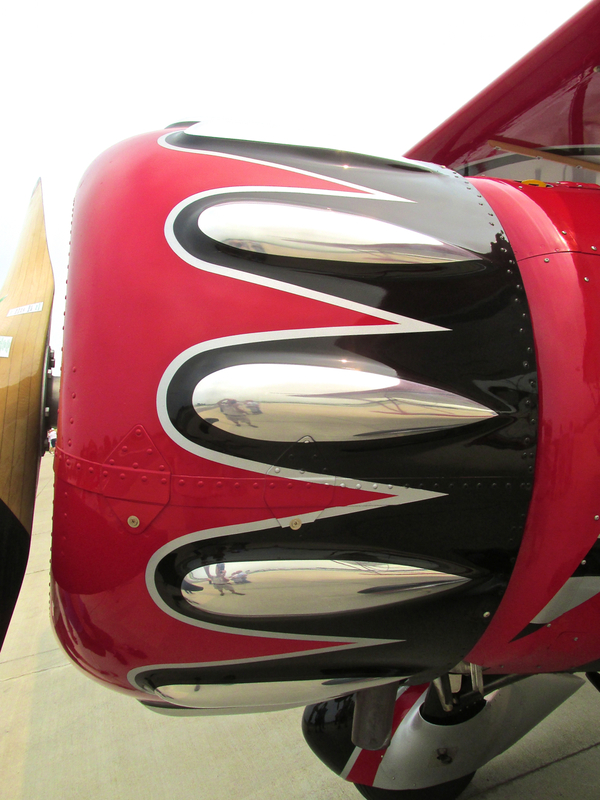 They also protect his paint – the main reason he put them on. 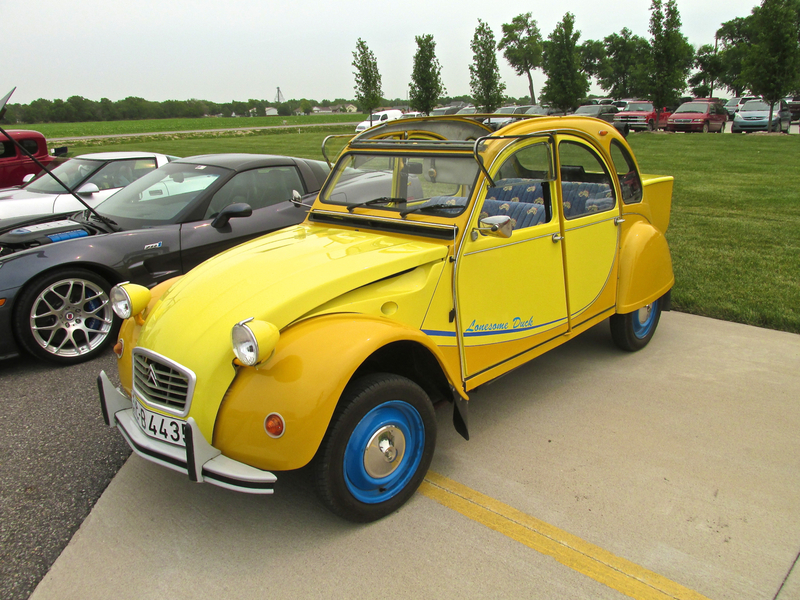 I hadn’t seen a Citroen for decades. This one looks better than new. 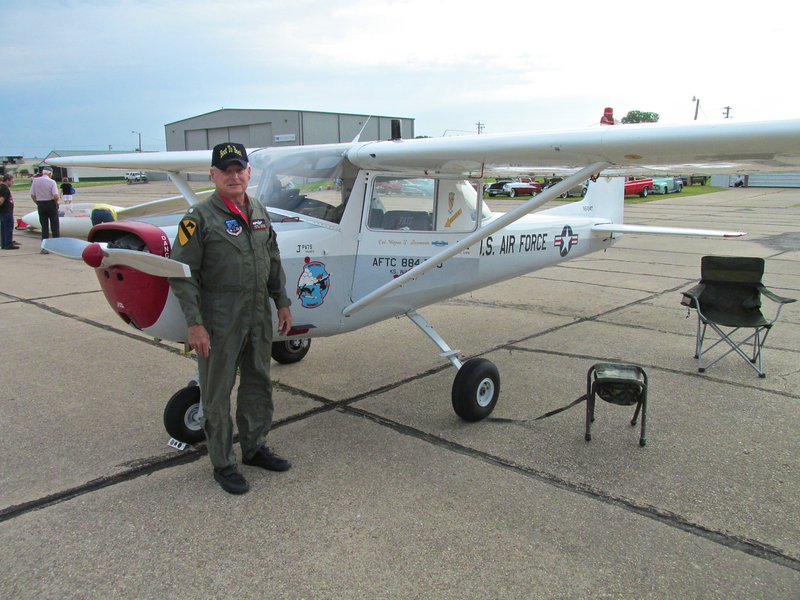 After Victor finished setting up his aircraft and jeep display he walked over to the tie down area where I ran into him. Figuratively anyway, because I wasn’t driving the golf cart at that moment. 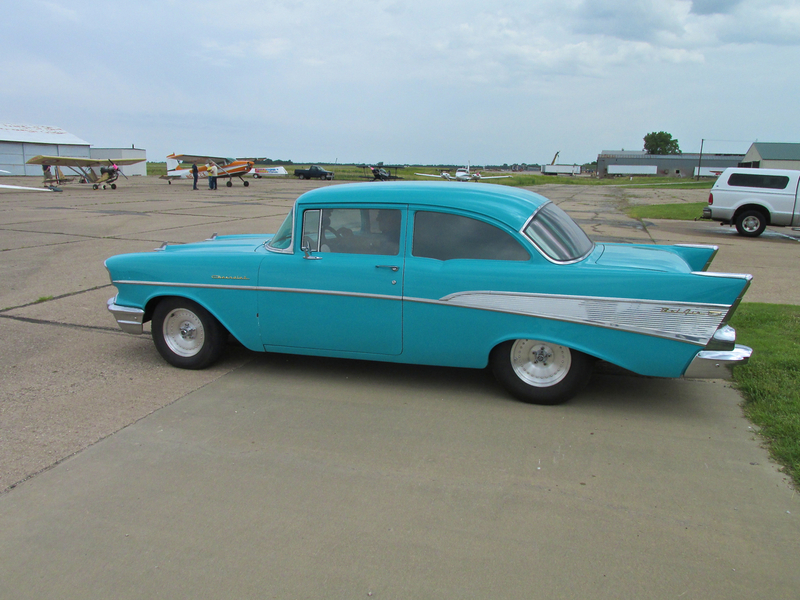 Vic knows I like Vintage Cars almost as much as I like Vintage Airplanes. He asked if I wanted to join him for a ride back down the runway to see something very special. Brian said “Yes” and we headed over to the Hangar Home of Eric Sorenson. 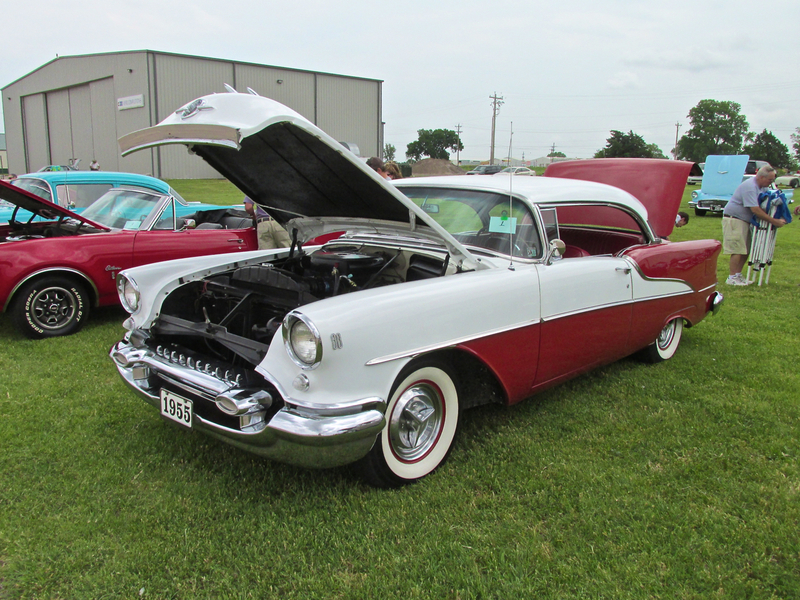 All have heard tales of The Classic Car owned by “The Older Lady” who only drove it to Church once a week and always kept it protected in a garage, made sure the oil was changed every six months, etc. This is that car. 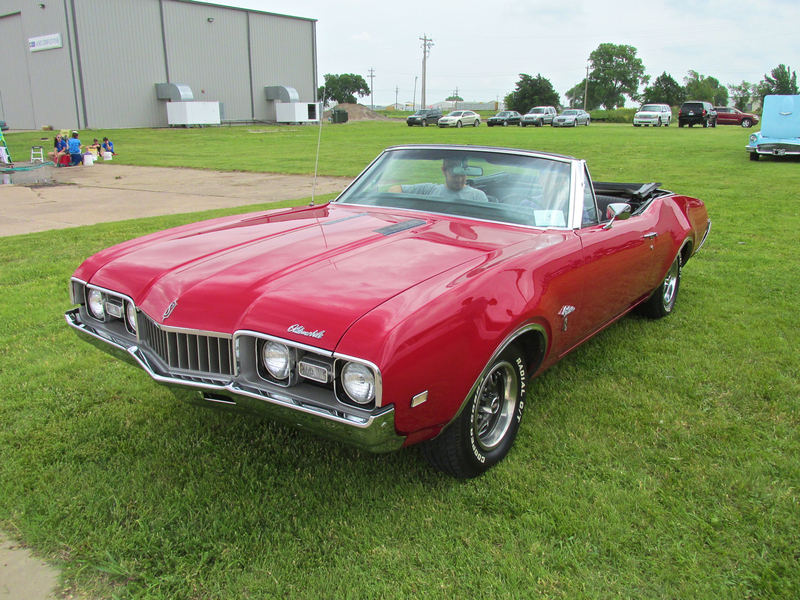 It has very few miles, still runs well and is in near showroom shape. This car also verifies the other “Garage Talk Conversation Staple” that goes under the heading, “They don’t make ’em like they used to…”. 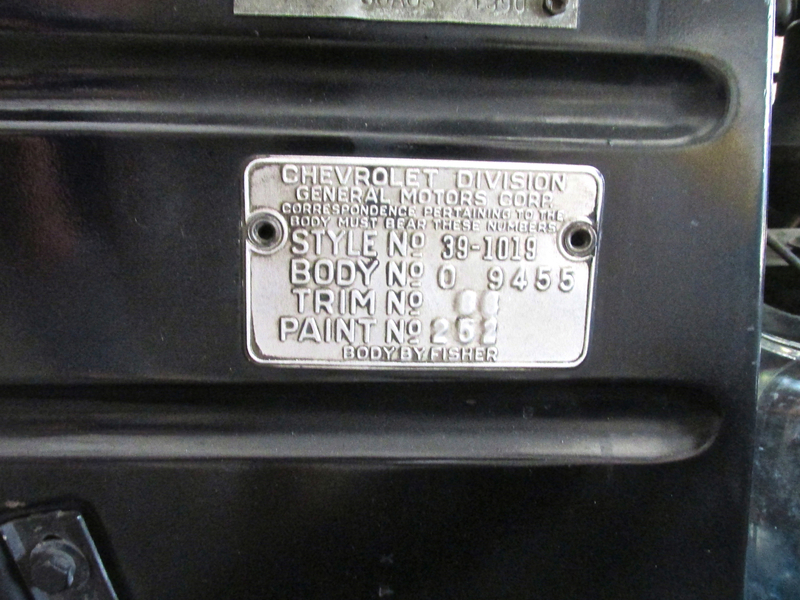 A casual glance at the original paint of this machine verifies that notion. You can judge the quality of it in the reflection of the fender in the photo above. Hearing the passenger door open and close was the auto equivalent of listening to a Stradivarius Violin. It was that fine. Eric has a valuable relic from a bygone era. 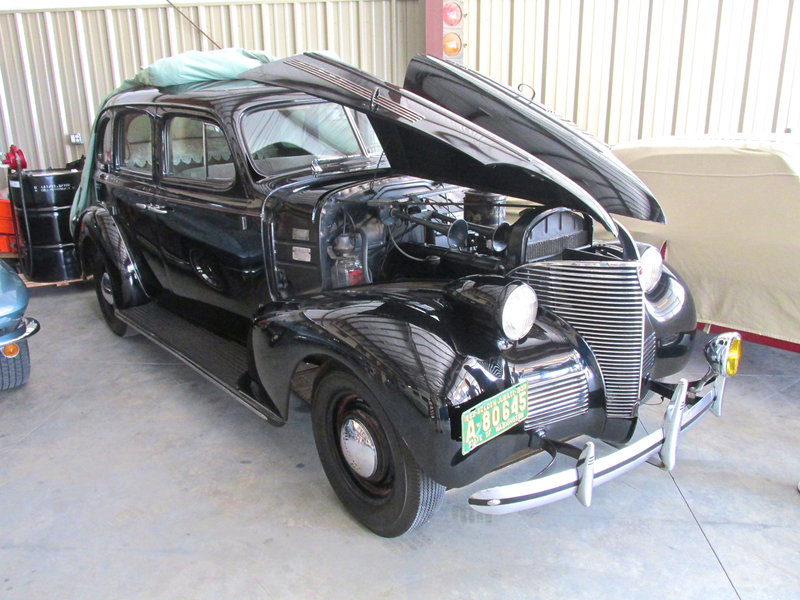 He also has the original registration papers AND original Gas Rationing Tickets from during World War II that were used with this car. After saying goodbye to Eric, Victor dropped me off at my car and I left Benton. Next year I’ll fly in to The Stearman Field Fly-In but as the event subtitle suggests, it is OK to arrive at a Wings & Wheels by air or land.